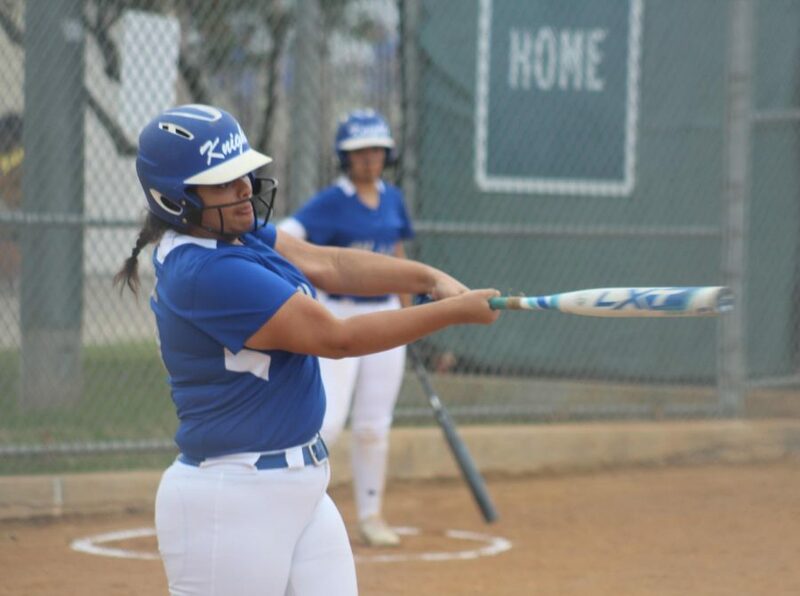 WHEN IT RAINS ON THE THE RAIDERS, IT POURS: Daisy Elizondo and Melany Reese were both a perfect 3-for-3 at the plate, and Ciara Medrano, Julia Crofut, Apolonia Briceno and Megan Shieh were a perfect 2-for-2 as just about everything went right for McCallum softball Tuesday night in a 19-1 drubbing of Reagan at Noack. The Knights scored 10 runs in the bottom of the first and nine more in the bottom of the second to knock out the Raiders after two and a half innings of play. Diamante Diaz drove in four runs, and Reese pitched three innings with five strikeouts for the run-rule shortened complete-game victory. 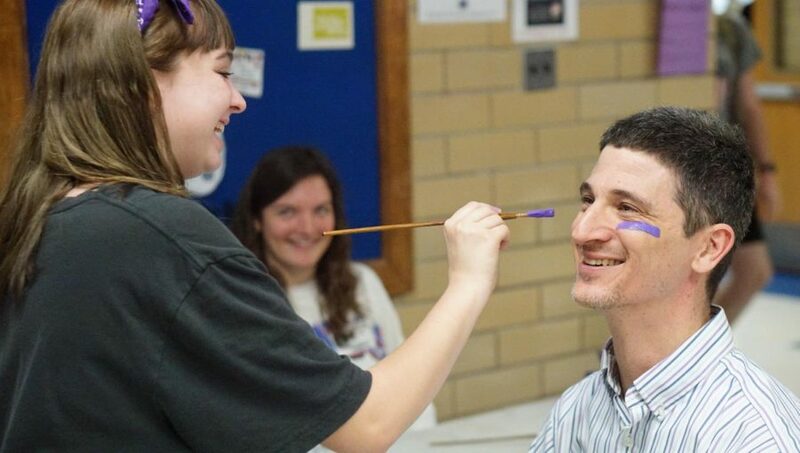 PAINT IT PURPLE (FOR ONCE): PALS sponsor Mr. Cowles smiles as he gets his face painted purple for International Women’s Day on Friday. 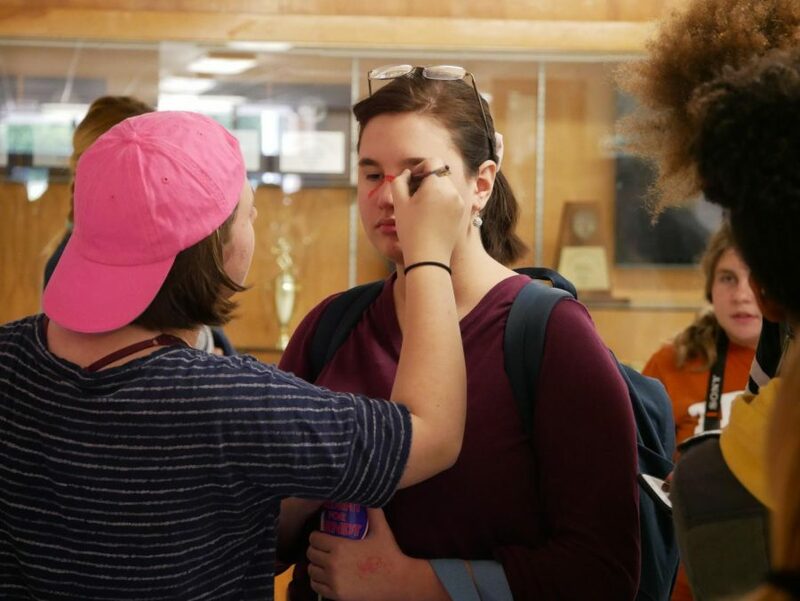 The McCallum PALS members offered free purple face painting to any students and teachers who wanted to celebrate the day. Junior Gage Bausman plays alongside sophomore Will Tanner and junior Sam Buford during the Chamber performance. The performance is a continuation of the Battle of the Bands fundraiser that helps the guitar program fund scholarships for students in the program that can’t afford to attend the trips with the ensemble. As a prize for winning the Battle of the Bands in November, Deva members Tomas Marrero, Memphis Lamont, Janssen Transsier and Asher Loewenstern performed at Stubbs tonight along with the Austin Cobb Trio. 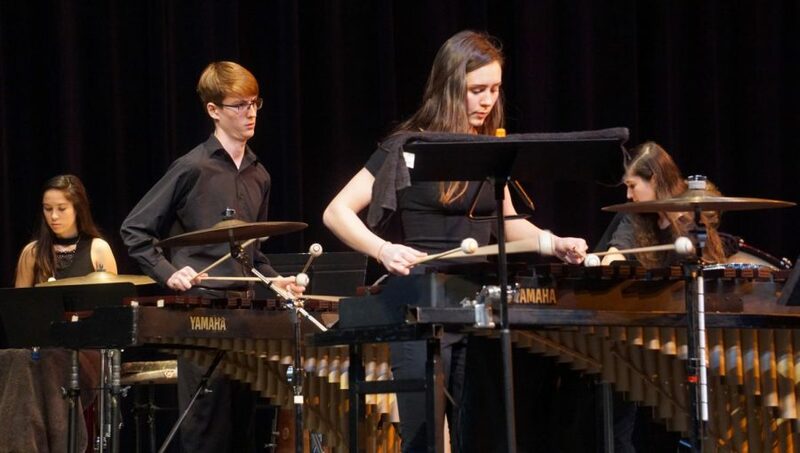 DRUMROLL PLEASE: In the MAC Friday night, the McCallum percussionists put on their annual “Knights of Percussion” showcase before a packed crowd. 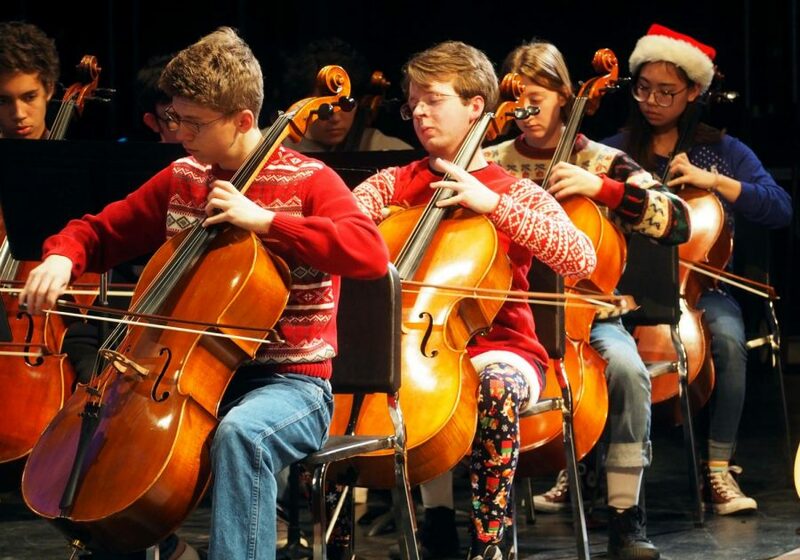 The Knights’ festivities featured a number of performances ranging from student solos to large ensemble songs to guest appearances from Lamar Middle School percussion students. 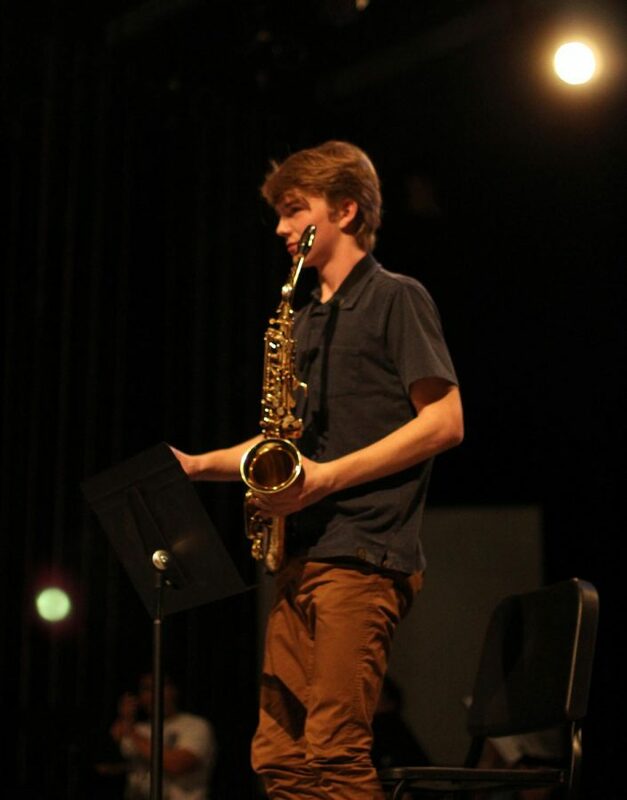 “I really enjoyed the variety of music that the different ensembles performed, some of which I heard for the very first time,” said percussionist Julian Smith, a sophomore. 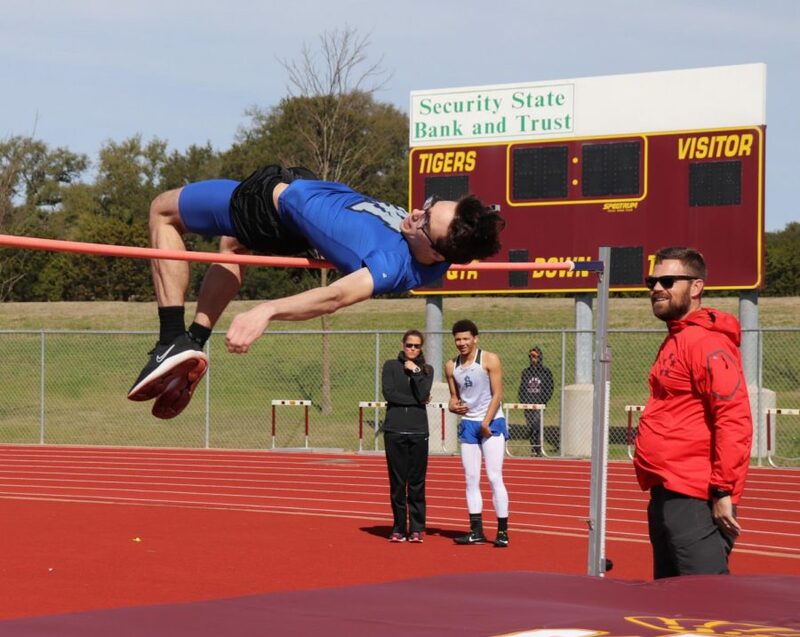 KEEPING TRACK ON MAC: Senior varsity high jumper Ian Shaw reaches a school record in the high jump, clearing a height of 6 feet, which landed him in fifth place. The track team traveled to Dripping Springs High School on Saturday to compete in the Tiger Relays. 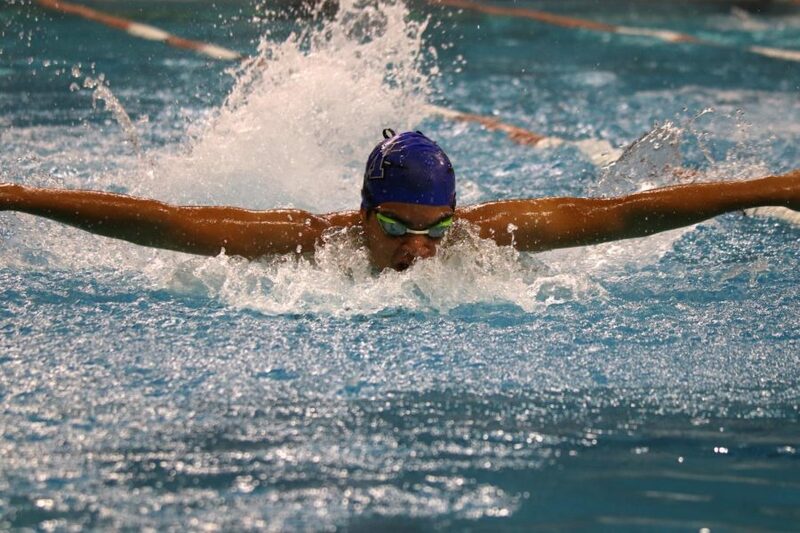 In a very competitive field, the Knights fared well in several events. Senior Deron Gage came in ninth place in the varsity 100-meter sprint, and senior Kennedy Austin claimed a personal record and 15th place in the same event. Junior varsity sprinter Caleb Brown finished in seventh place in the 100 meters with a personal record. In the 200 meters, varsity runners Deron Gage and Cruz Escobar finished back to back in eighth and ninth place. The Knights also enjoyed success in their various field events. In shot put, varsity junior Kyla Gibson and JV freshman Selena De Jesus Levya came home with personal records and top 20 placements. 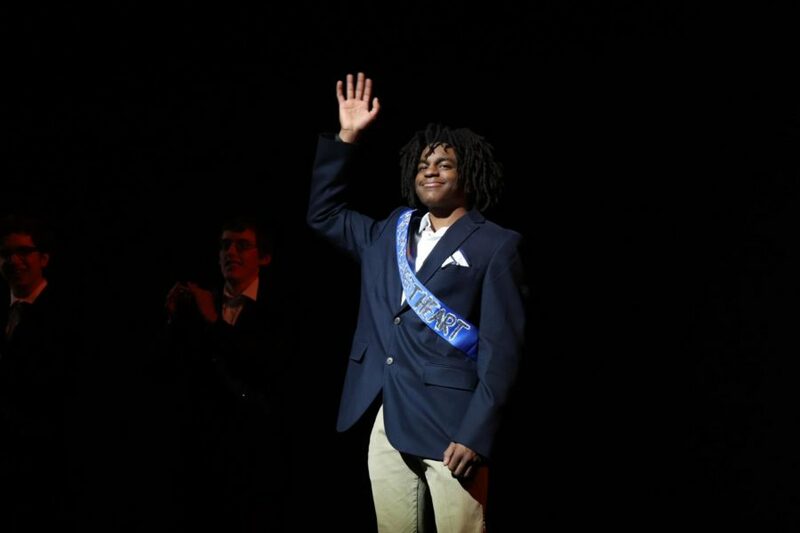 MR. MAC: The 2019 Mr. McCallum, Gabe Williams, waves to the crowd after his victory was announced. After three rounds of fierce competition, Williams was awarded both Mr. McSweetheart and the Mr. McCallum pageant crown Saturday evening in the MAC theatre. 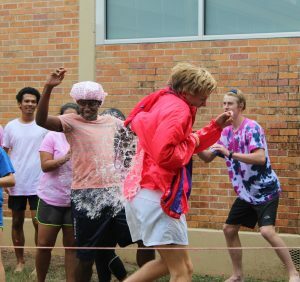 Eleven other senior boys competed in the interview, talent and swimwear rounds, hoping to win the audience’s votes with their ability and charm. Robert Gossard was the runner-up and Luke Thiessen was awarded Mr. Congeniality. 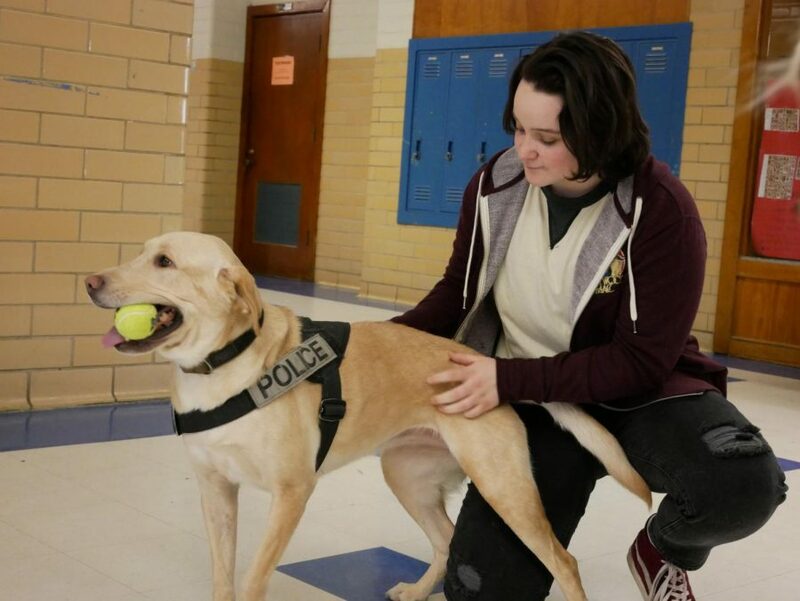 K_9 PLAY TIME: Senior Sutton Ballard and Luca, an AISD drug dog, play a quick game of fetch in the main hallway. Luca, AISD’s sole drug dog, arrived at McCallum today along with her partner Officer Seagrave. Luca, whose training cost AISD $10,000, was excited to show off her obedience and tennis ball-catching skills for a crowd of students during sixth period before leaving to investigate the campus. DRAWING LESSONS: Senior Adrian Martinez dribbles past an opposing Travis player. 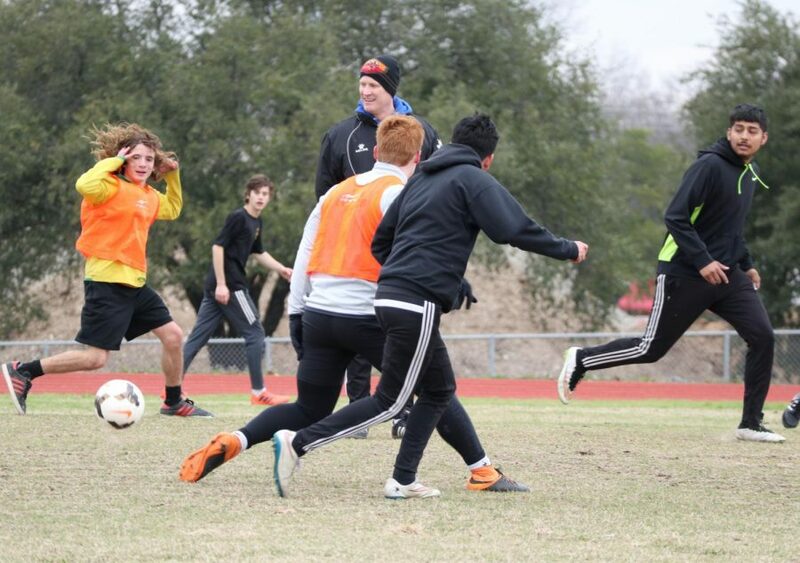 The boys varsity soccer team played Travis to a 2-2 draw Saturday at House Park. Lucas Ramos De Barros scored (assisted by Marcel Lopez-Reed) as did Anthony Bataille (assisted by Luis Auyero). 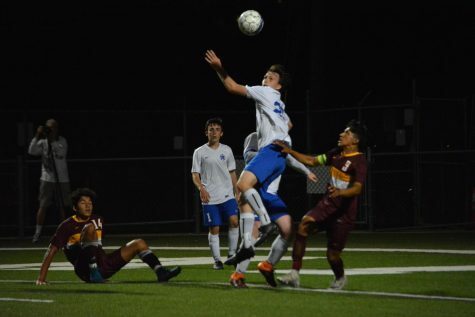 “The team played well,” fellow varsity player Jimmy Walker said, “but we need to work on maintaining and finishing the game.” The team has earned three draws and lost once in its last four. 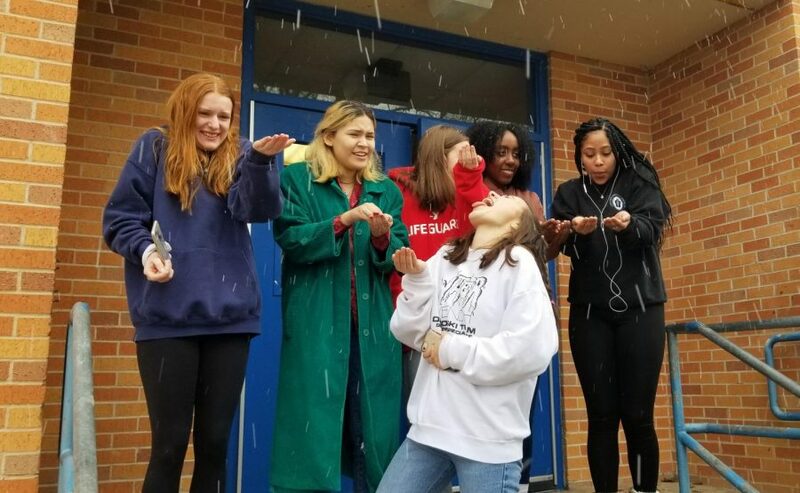 Although it could not technically be considered snow, on Friday, students and faculty were greeted with a small blast of hail heavy enough to divert a few Knights from their end of the six weeks studies. Starting during second period and continuing on-and-off throughout the day, many Knights were able to take advantage of the cold weather with a few minutes of fun. 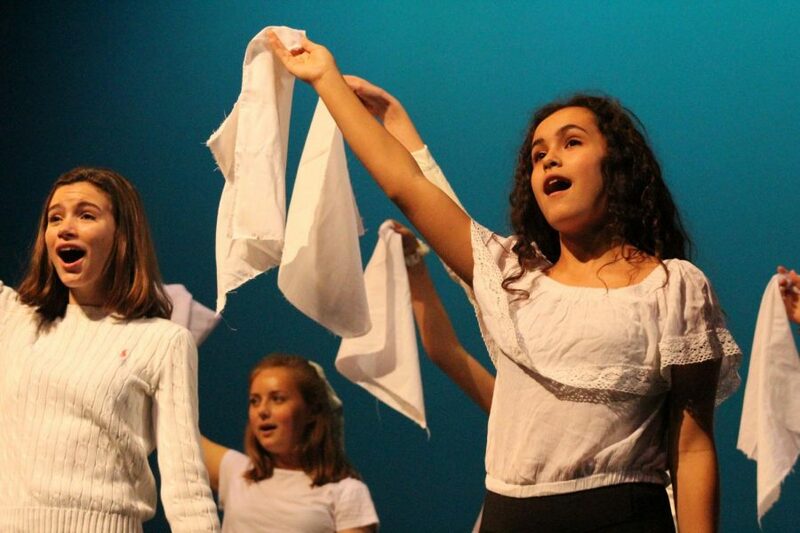 STAGE LEFT: The ensemble gestures alongside lead juniors Helena Laing and Tosh Arora at the end of the finale number. 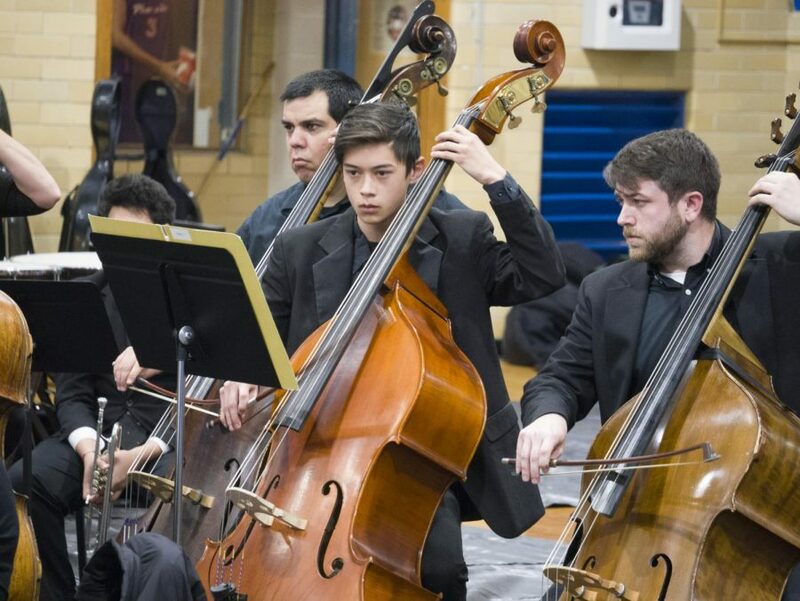 OVERCOMING ADVERSITY: Junior Jack Montisinos plats alongslide members of the Austin Symphony Orchestra. The symphony orchestra came to McCallum today to play for the students and with some distinguished members of the McCallum orchestra. This year’s theme is “overcoming adversity,” and all of the pieces played were by composers that were, at the time of the piece, had to overcome intense adversity. The orchestra played pieces by Beethoven, Lili Boulanger, Shostakovich, William Grant Still, Korngold, and then McCallum orchestra students joined in for a piece by Tchaikovsky. 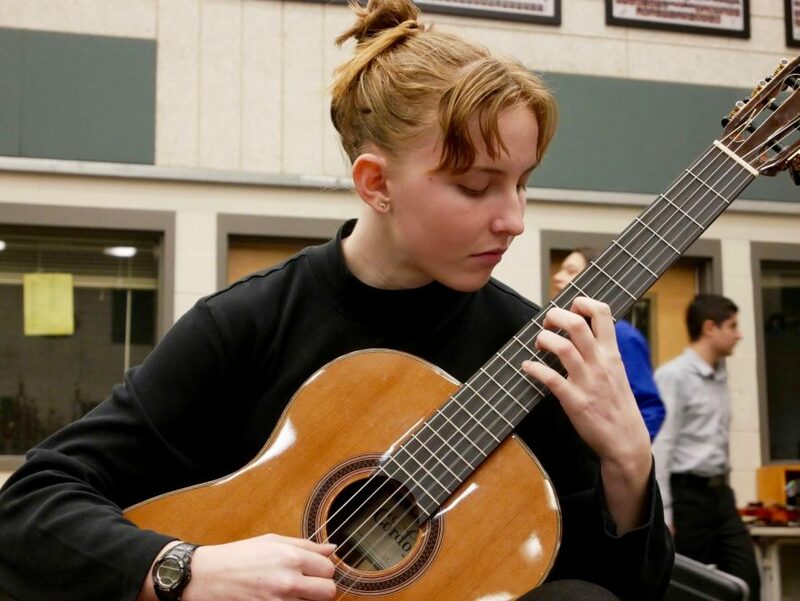 MOVING ON UP: Senior Marianna Vanden Boutpractices her solo, Prelude One by Hietor Villa Lobos, before her turn to play for a judge at UIL Solo and Ensamble on Saturday. 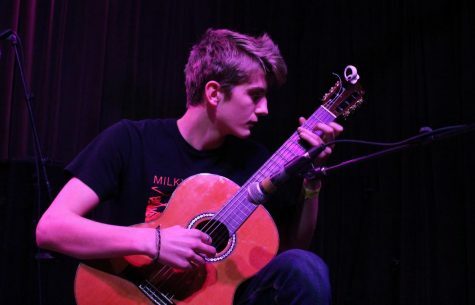 Vanden Bout, along with 15 other McCallum guitarists qualified to move on to state. 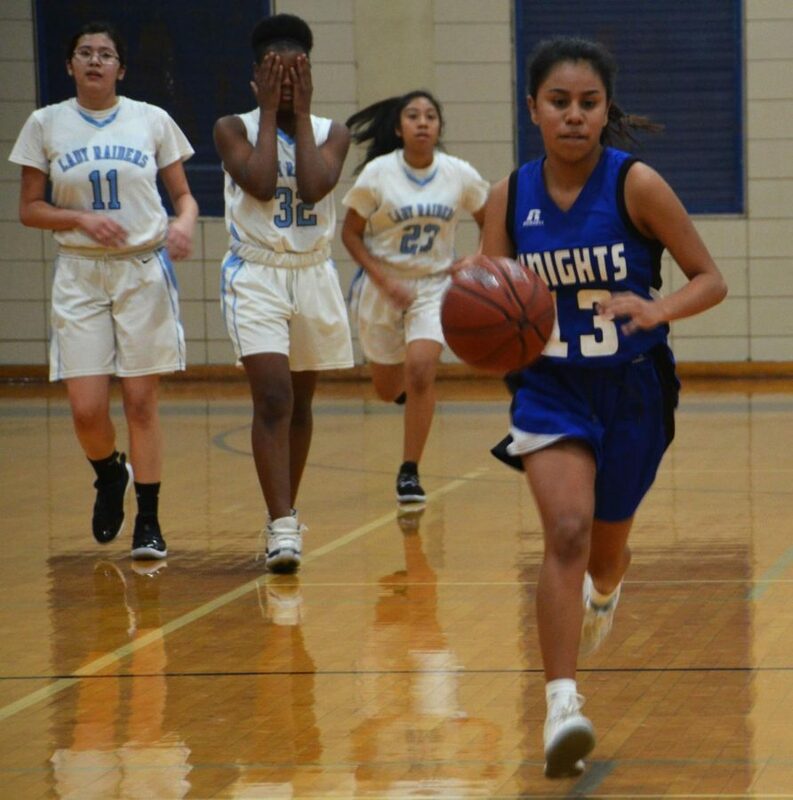 RAIDERS EDGE GIRLS VARSITY BY ONE POINT: The girls varsity basketball team lost a nailbiter on the road at Reagan Friday night by a final score of 30-29. 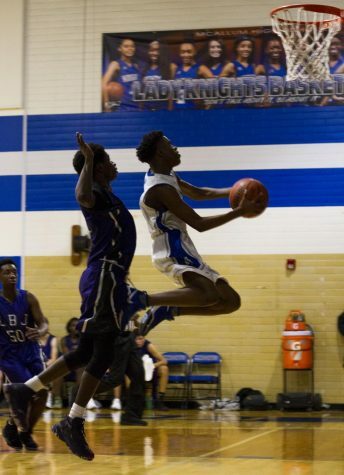 The Knights hope to reverse their fortunes on Tuesday when they host last-place Travis in a district game. After a Friday trip to play first-place Dripping Springs, the girls will close the district season on Tuesday Feb. 5 with a home game against Lanier. VARSITY GIRLS 2, CEDAR CREEK: Center back Ellie Stites protects the goal by kicking the ball far out of range. 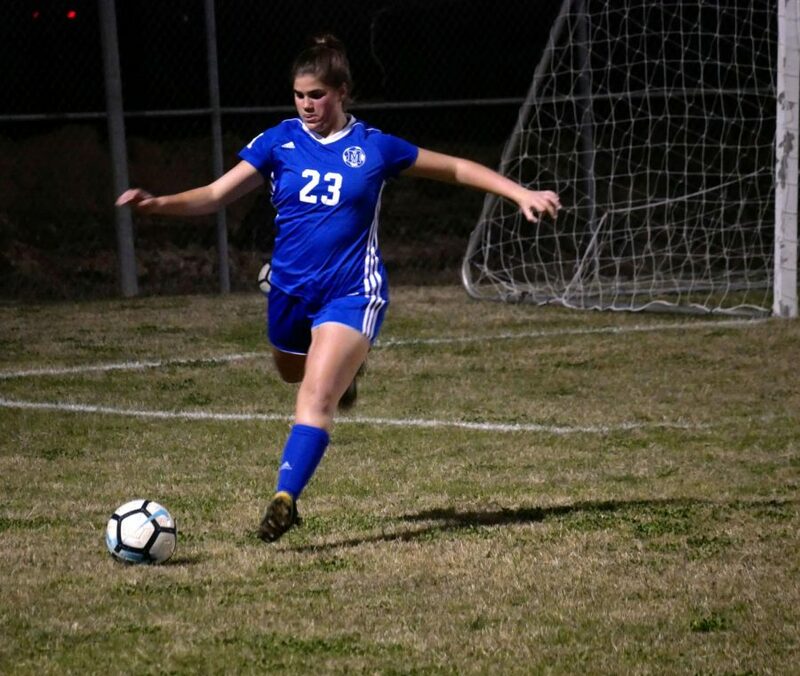 The varsity girls soccer team completed a Noack sweep of Cedar Creek on Friday night thanks to the goal scoring of two varsity freshman: Carly Johnson and Mia Gomez. Sophomore Lindsey Plotkin earned the clean sheet in goal. The team has one more friendly (non-district game) before the district campaign begins on Friday. 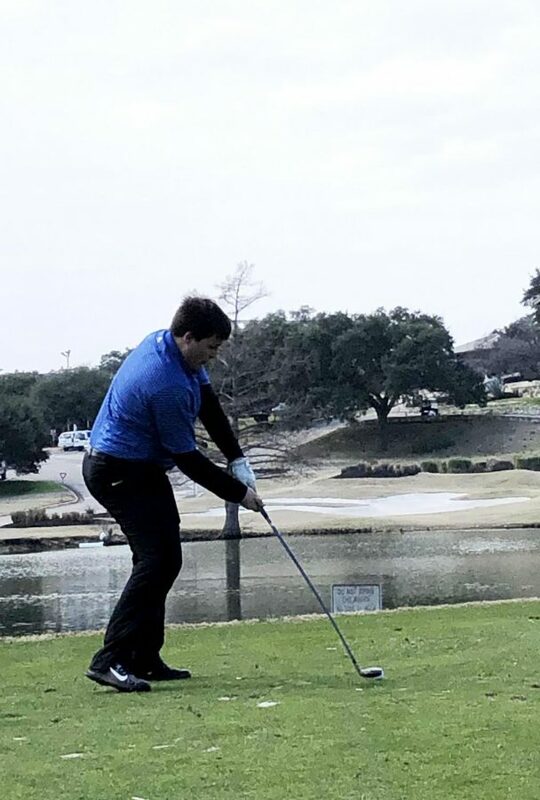 FORE SURE: Emmett Sweeney shot a team-low 82 with teammate Zach Masterson right behind him at 83 as the Mac golf team enjoyed a strong showing Monday in a tournament hosted by Westlake at played at the Lost Creek Country Club. “The course was very narrow with lots of water,” Sweeney said. “None of us had played it before so overall [we posted] good scores.” Andrew Clay and Henry Sandlin had their personal best scores, and Paul Raper played his first tournament ever. The team’s next tournament is at Delware Springs. 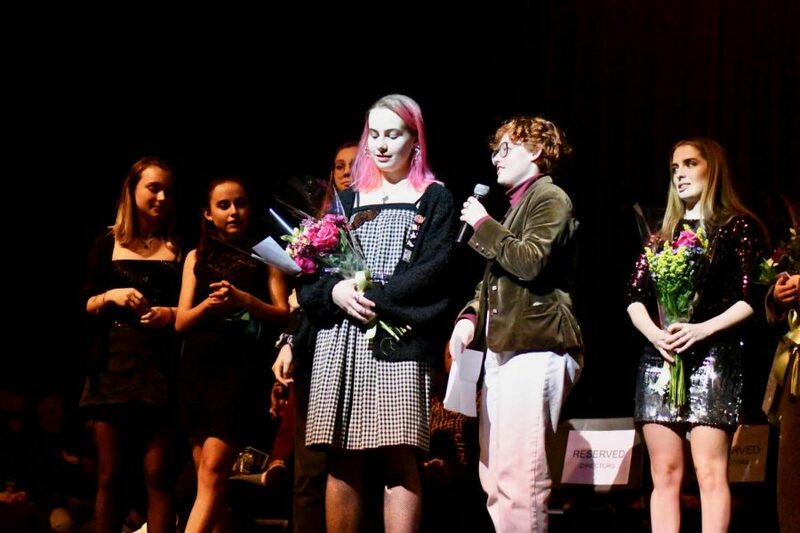 AMAZING GRACIE: On Saturday night, the winner was announced for the 2019 benefit fashion show, senior Skel Gracie. Gracie was awarded a prize of $500 and the opportunity for her line to be featured and walked in a professional fashion show. “My archetype was ‘creature of nightmares’” Gracie told The Shield. 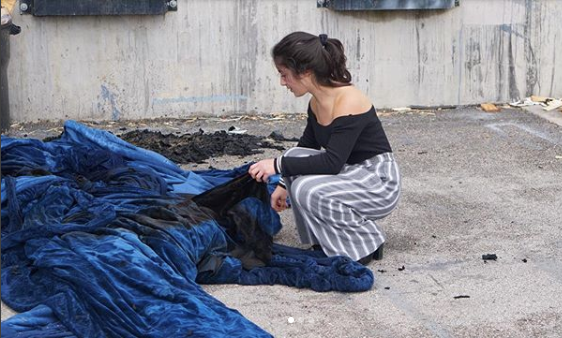 “I drew inspiration from my own, personal nightmares, as well as the common themes of pop-horror like American horror story.” This is Gracie’s 2nd year designing in the fashion show, “My favorite part about making the line was the creativity I was able to have.” Gracie said. “Such as the problem solving aspect of a lot of the garments. I find the process of being able to take something from vague sketches to tangible, complete outfits really rewarding, and it’s always amazing to look back and realize like, ‘oh hey, I did that!” Photo by Bella Russo. 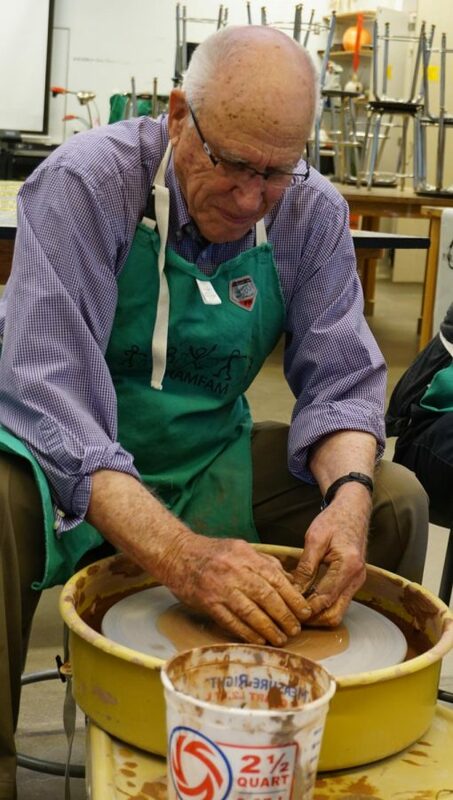 WHEEL POWER: Chemistry teacher Robert Lehman is the portrait of concentration during Carey West’s second pottery-wheel throwing session during the Maculty’s Teach Your Passion in-service in the Art 3 classroom in the MAC. 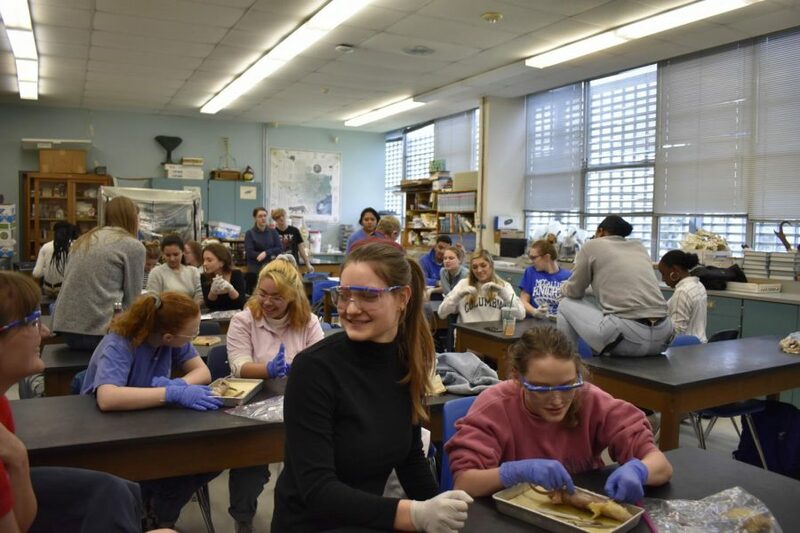 All day, Maculty members engaged in a pair of 45-minute morning sessions in which teachers shared their disciplines and other fields of expertise with their colleagues before students arrived back at school. ALUMS 5, VARSITY 4: The boys varsity soccer team kicked off its 2019 campaign before the New Year on December 29th with a scrimmage game against the alumni. The alums, who outnumbered the varsity by about 10 players, prevailed in the game, 5-4, overcoming a stretch of game action where all 22 varsity players stormed the field at once. Coach Martin called the contest “a fun, chaotic game” in which no individual stats were kept. 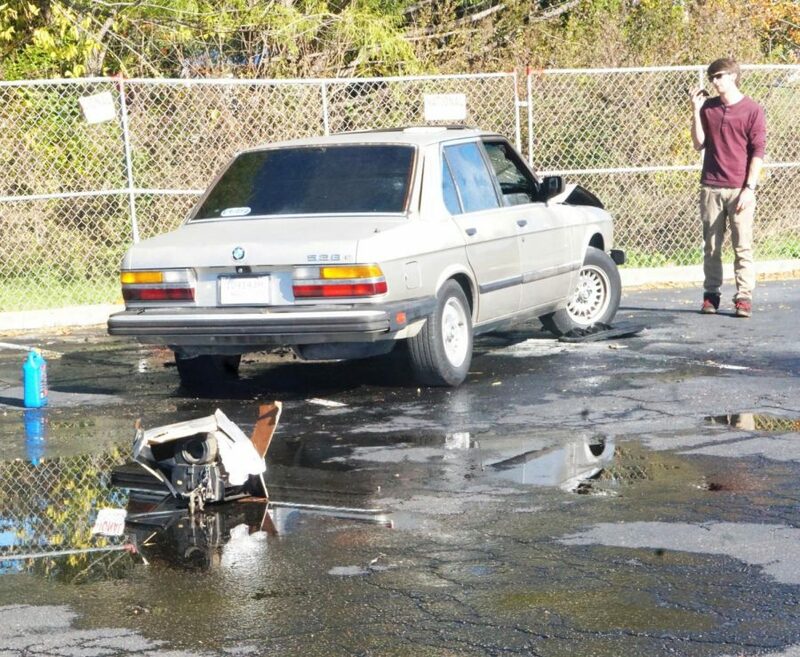 BACKFIRE SPARKS CAR FIRE: Just after 1 p.m. December 10th, neighborhood resident Adam Rice was working on his car in the Dart Bowl parking lot. The car had backfired before, but when the hood started smoking, he knew he had to get out of the vehicle. When he opened the hood to examine the cause of the smoke, flames erupted from underneath. Rice tried to extinguish them with a towel, but the fire continued to reignite. His fuel line melted and caught fire, spraying gas everywhere. He immediately closed the hood and called the fire department. A bystander helped him put out most of the fire with an extinguisher, but unfortunately, it spread to the interior. Soon afterward, the whole car went up in flames. “It sucked.” was all Rice had to say about the event. Eventually, the fire department arrived to put out the fire, but Rice, who was trying to fix his car for a long time, thinks that he will have to start back at square one. BE OUR GUEST: Zara Terrazas Graham, along with the rest of McCallum’s Concert choir, sings “Be Our Guest” from “Beauty and the Beast” on Friday night’s Cabaret performance. 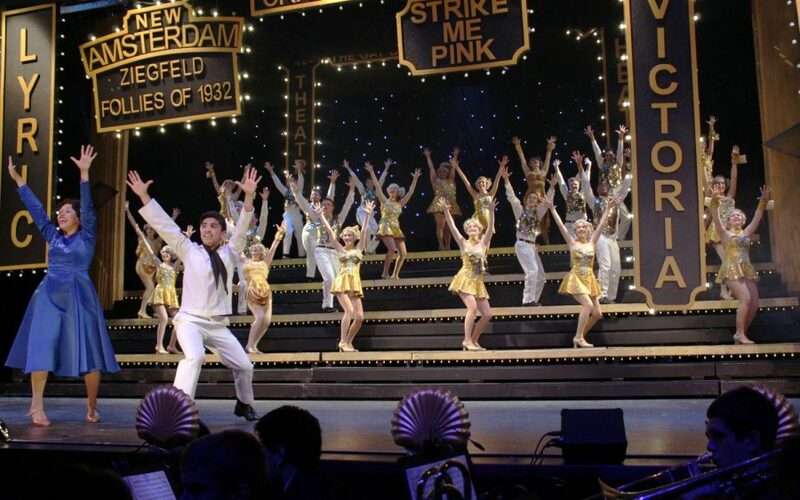 The choir rehearsed this song for weeks prior to the show’s opening. Graham said, “It was pretty stressful with all the rehearsals, but we improved each time”. 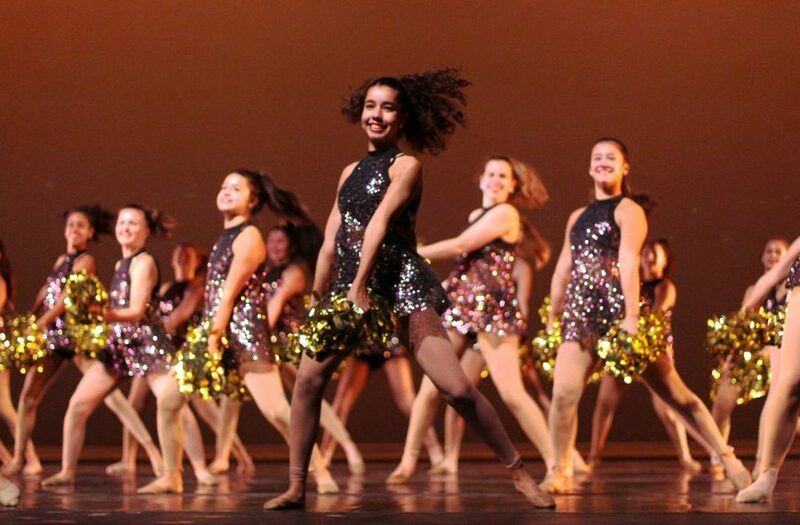 HINY DANCERS: The McCallum Blue Brigade was among the 600 dancers from 24 Austin ISD schools that drew a crowded house at the AISD Performing Arts Center for the December 4th AISD Dance Spectacular. SEIZING THE HIGH GROUND: Junior Sam Werkinthin attempts to dribble past a St. Andrew’s defender. The boys varsity basketball team earned its first win of the young season this afternoon by defeating St. Andrew’s, 40-28, at Don Caldwell Gymnasium. Norman Boyd led all scorers with 21 points. Albert Garza chipped in 11. Kobe Dunbar paced the visiting Highlanders with nine points. Freshman Aiden Wright hit a pair of three throws in his varsity debut. 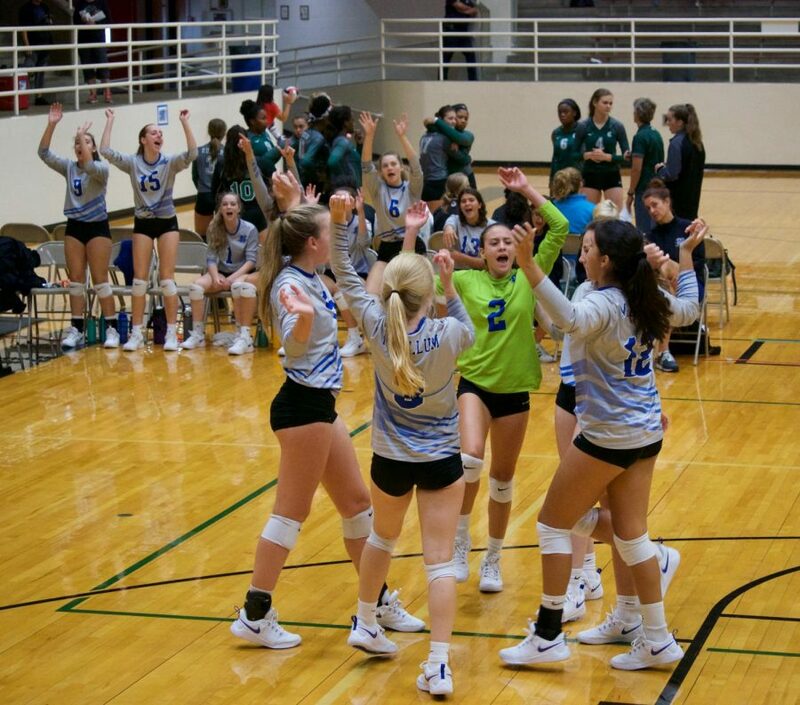 The Knights hope to make it two pre-turkey victories in a row when they face the Bastrop Bears in their gym at 3 p.m. tomorrow. 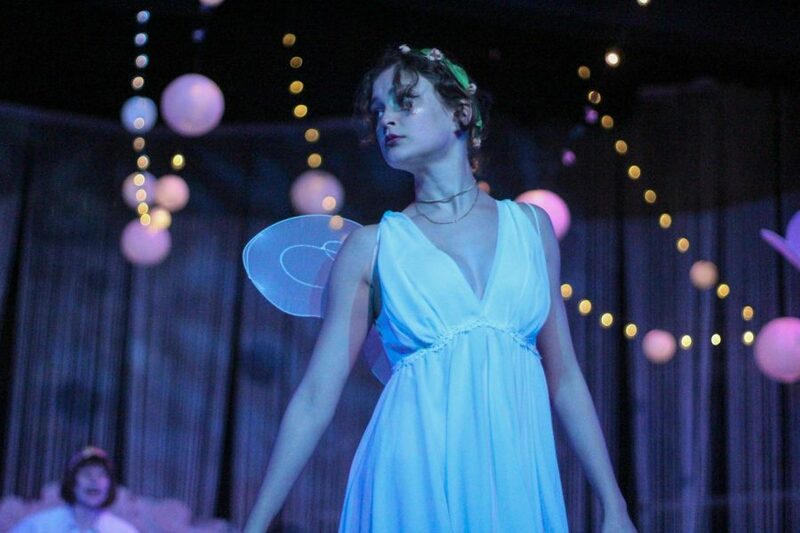 The freshman and JV games kickoff the tripleheader at 1 p.m.
Pease Blossom (junior Julia Blackmon) stands onstage arguing with the mischievous Puck during Mactheatre’s final rehearsal of “A Midsummer Night’s Dream” before opening night. Director Adam Miller-Batteau surprised the cast at Wednesday’s dress rehearsal by telling them they would be doing their final rehearsal in an “Italian run.” An Italian run is when you run the whole show faster with more energy and exaggerated hand gestures. 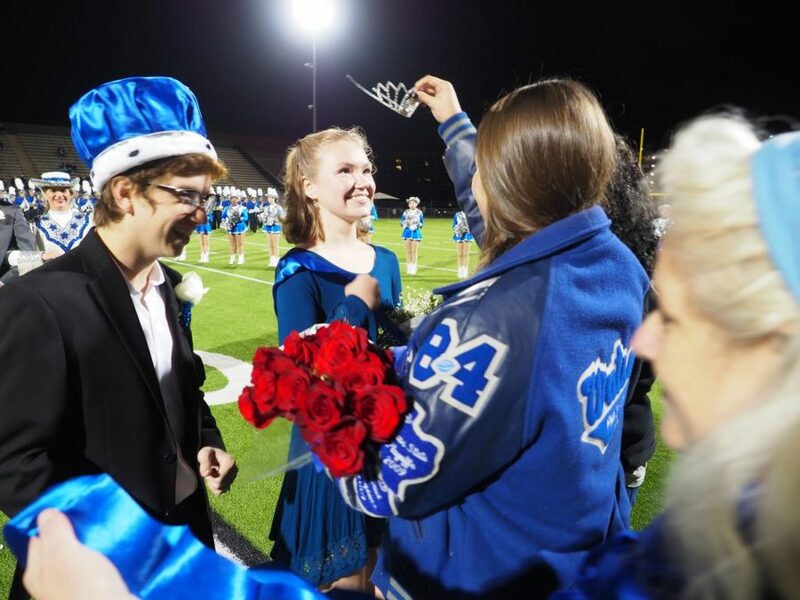 HOMECOMING KING AND QUEEN: At halftime of McCallum’s victory over Crockett at House Park on Nov. 1, seniors Dillon Guerrero and Ardis Warrenfells were crowned the homecoming king and queen. The rest of the homecoming court included junior prince and princess Cole Davis and Amelia Paul, duke and duchess Aydan Howison and Zoe Hutchens, and freshmen baron and baroness, Bobby Currie and Tracy Atoo. 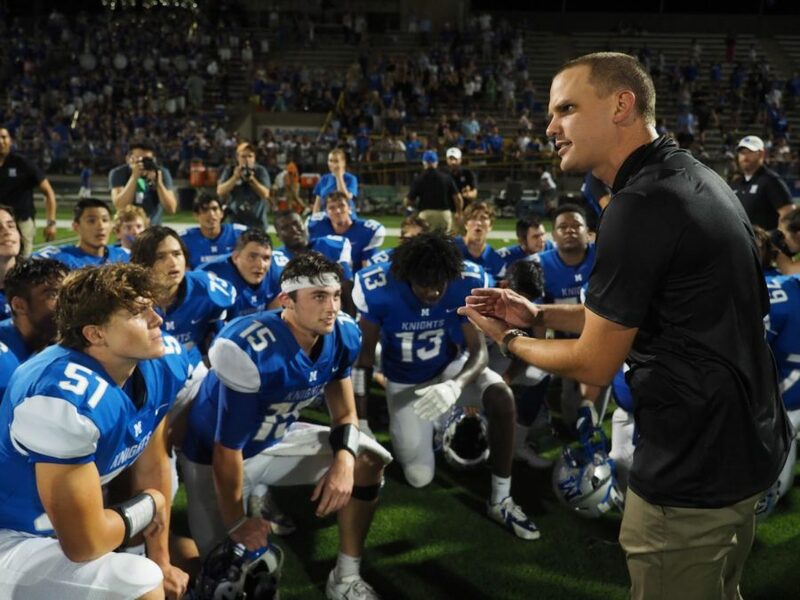 DO YOUR JOB: Coach Thomas Gammerdinger talks with the defense after coming off the field during the Knights’ 42-3 win over Crockett. The Knights defense was able to hold Crockett to only three points in their Homecoming game. 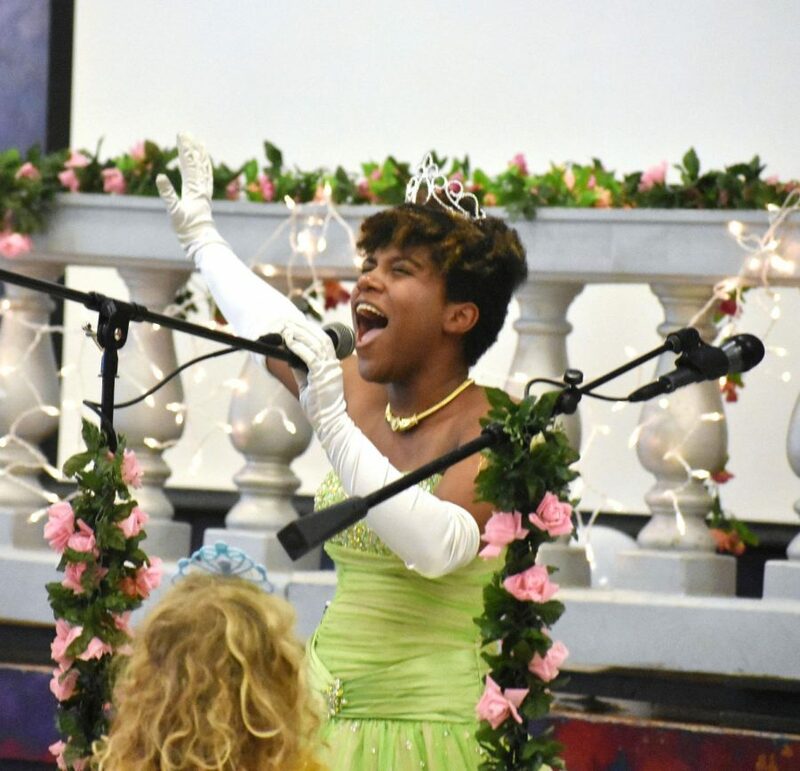 PRINCESS AND THE TEA: Sophomore Marlee Foster (Tiana) sings the last song of Saturday afternoon’s fourth annual Princess Tea Party fundraiser for Mactheatre. With a packed auditorium, children from all over Austin got to see their favorite princes and princesses. 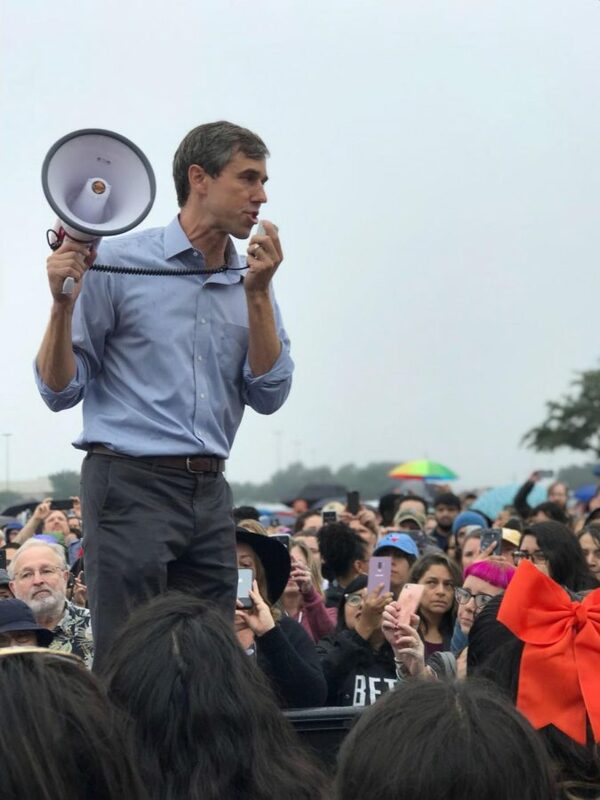 ELECTION TIME IN TEXAS: Texas U.S. Senatorial candidate Beto O’ Rourke visited the campus of ACC Highland on the morning of Oct. 24 to get people to vote in the #midtermelections2018. O’Rourke spoke at polling places throughout Austin on Oct. 24, encouraging people to vote. He also visited Kealing Middle School. Sophomore Bela Tapperson inspects the charred curtain Tuesday morning after the second fire in the MAC. Tapperson was shocked when she saw the Austin Fire Department’s post about the second fire on twitter. “I thought it was a mistake at first,” Tapperson said. “There were like 6 fire trucks here [yesterday] and we thought they put it all out.” Photo by Kelsey Tasch. 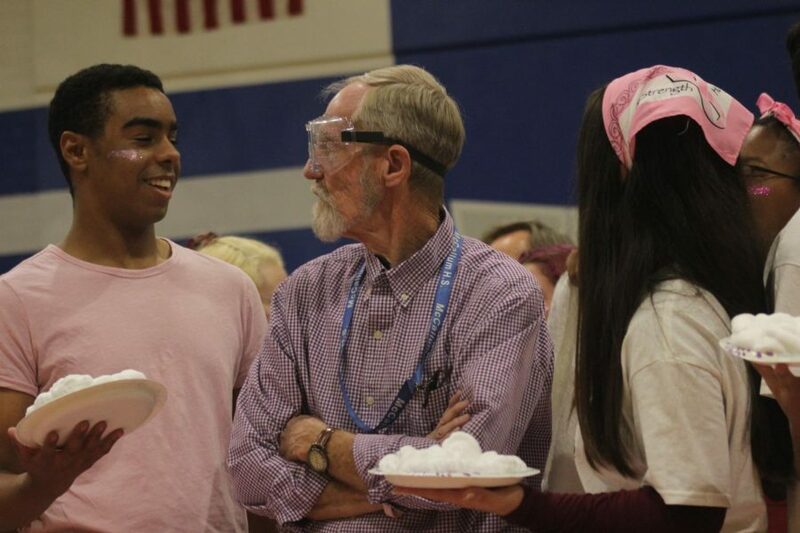 A GOOD DAY TO PIE HARD: Science teacher Richard Whisennand stares down PAL Owen Scales. The MACulty were served a large helping of pie (shaving cream) in the pink week pep rally. Some of the other teachers pied were David Winter, Ann Marquez, coach Daniel Fuentes, and of course principal Mike Garrison. 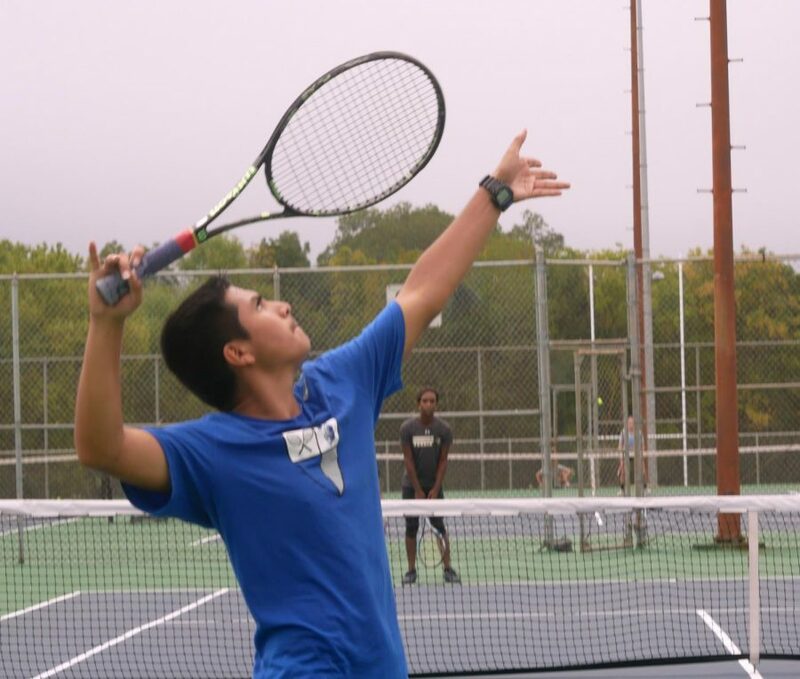 SERVING A WIN: Junior co-captain Richard Hernandez serves the ball during a singles match against Lanier. The tennis team beat Lanier with a score of 10-1 matches but lost to LBJ, 0-10 matches at the District Tournament. Coach Oakley Barber encouraged the team to play and have fun but not to worry about winning. They return to the courts to play Lockhart after school Wednesday in their final matches of the fall season. HE REALLY IS A MAC DADDY: Camila Gammerdinger made a brief appearance at Mac on Sept. 26 in order to inspect the Taco Shack trophy in the main office. After verifying that it was in its proper place, she headed for the hallway for a brief campus tour. When reporters encountered her there, they asked her for a statement about LBJ, and she declined comment. SHOOTING FOR THE STARMITES: The MacTheatre fall musical “Starmites” opened Thursday in the MAC at 7 p.m. 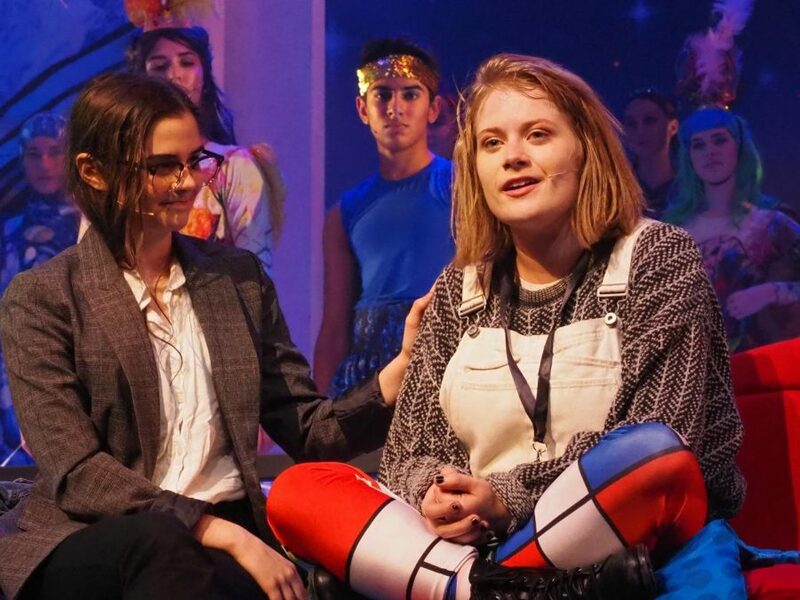 The show centers around Eleanor (Maryanna Tollemache), a shy teenager who loves comic books, but whose mother (Lilah Guaragna) wants her to stop believing in the fantasy world in the books that have led Eleanor to the point of outbursts of terror in school. Eleanor is then summoned to Innerspace by the Starmites, a rag tag group of guardians named S’up S’up Sensaboi (Sam Richter), Ack Ack Hackerax (Javier Garcia), Diggity Razzle Dazzle (Duvall Bingham), and their leader SpacePunk (Tosh Arora) who wish to defeat the evil cruelty of Shak Graa (Matthew Hernandez). 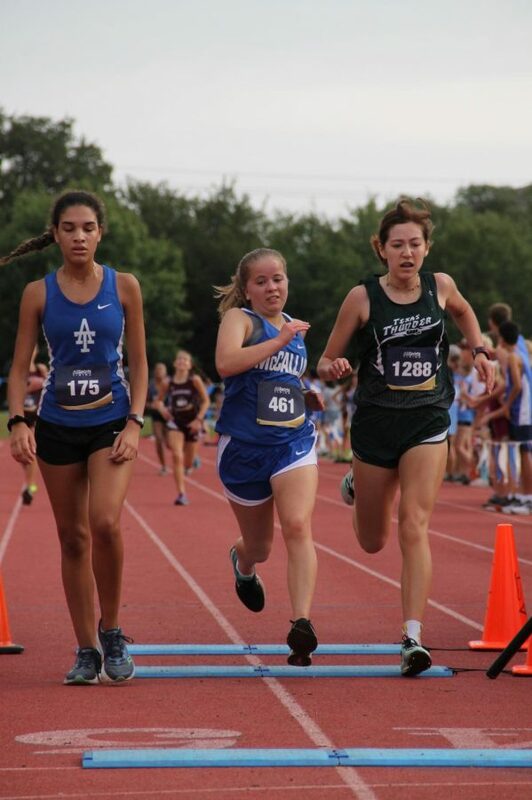 NEITHER PAIN NOR HEAT: Junior Kristen Tibbetts pushes past her competition on the last stretch of the Saint Andrews Invitational varsity girls 5k. 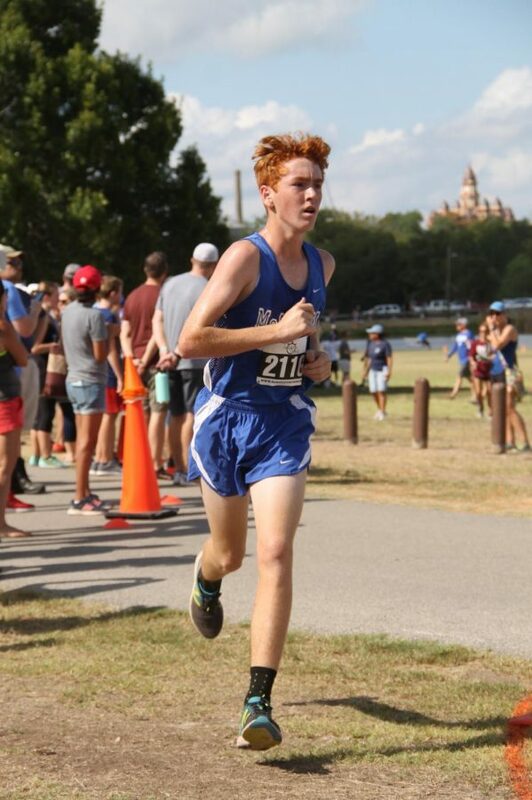 The varsity Boys finished in 13th overall while the JV boys were, 10th; the varsity girls, 14th; and the JV girls, 12th. CARRY THE TORCH: The varsity football team beat the Anderson Trojans 21-20 in the annual Taco Shack Bowl to break the tie between the two teams for the number of total wins in the series. Keeping with tradition, Taco Shack owner Orlando Arriaga was there to give the winning team the trophy, which has been McCallum for the past three years. The series now stands at 9-8. It was the first career win for Thomas Gammerdinger (Coach G) as head coach. 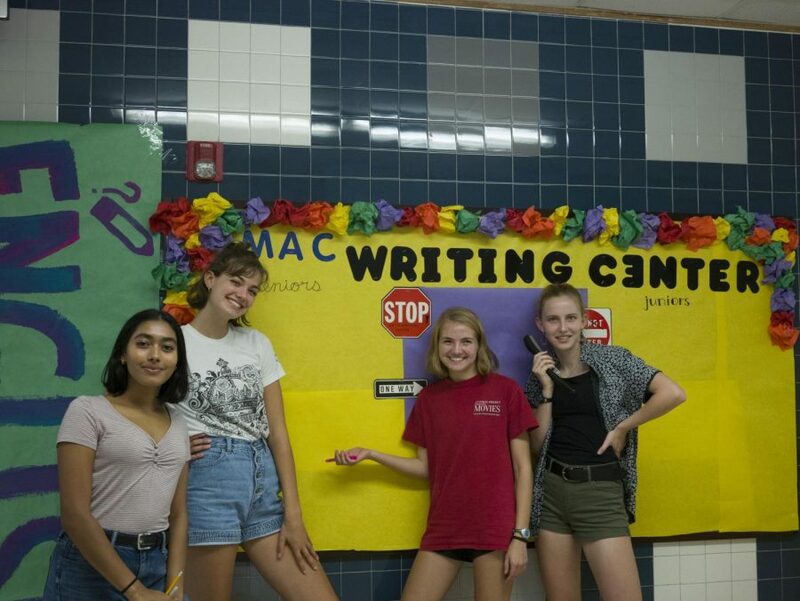 THE WRITE STUFF: Writing Center tutors — senior Meghana Goli, junior Sophie Knifton, senior Piper Wiest, senior Marianna Vanden Bout (pictured), junior Sam Buford and junior Kristen Tibbetts (not pictured) — decorated a sign-up board in the English hallway to encourage students to come in for free writing tutoring throughout upcoming the school year. 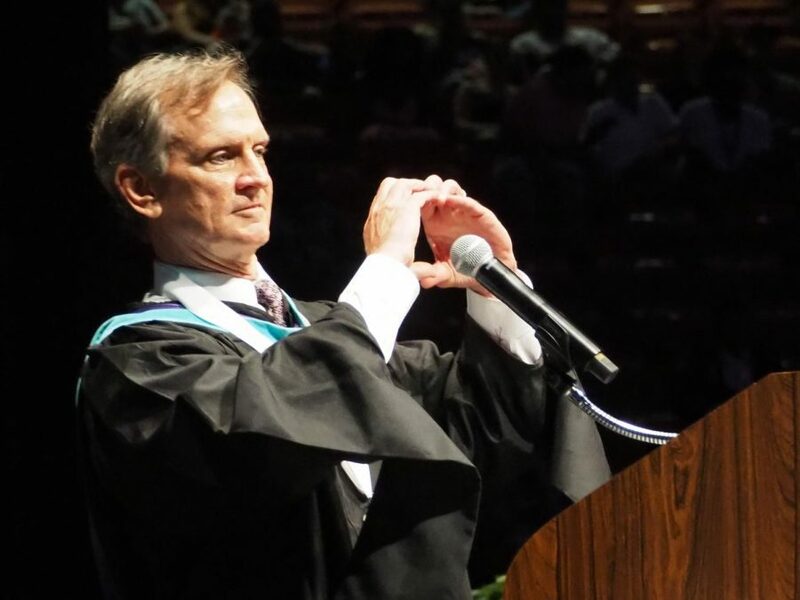 POMP AND CIRCUMSTANCE: Principal Mike Garrison gives a heart symbol to the graduates after they have received their diplomas and been certified as graduates. The commencement ceremony for the Class of 2018 was held May 31st in the Frank Erwin Center on the UT campus. Mr. Garrison opened the festivities with a speech about how the graduates’ experiences at McCallum have laid the foundation for a successful future. The graduation closed with the school song. FOUL PLAY: Sophomore Olivia Flowers helps Mr. Barber and Ms. Smith corral the roosters that arrived in the main hallway just as the fourth-period final ended May 30th. 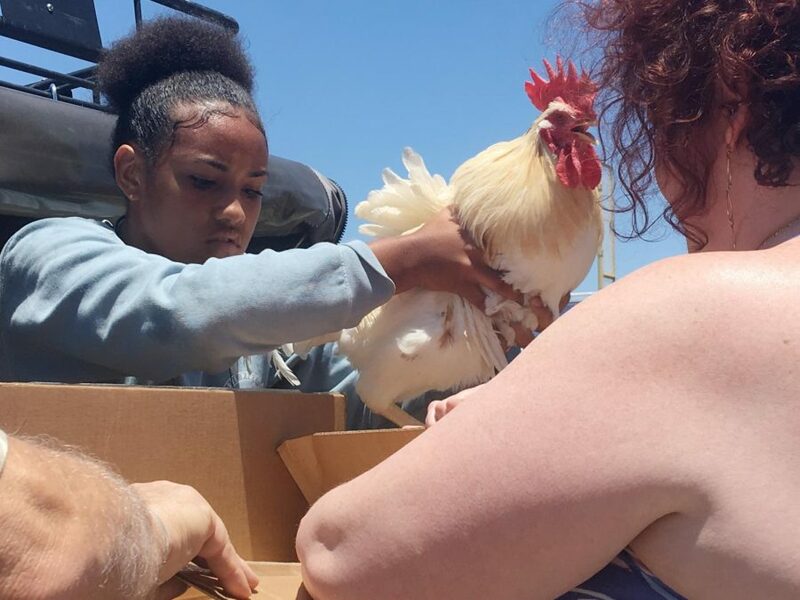 Rumor has it the apparent senior prank is likely to become a faculty gift to teachers with the capacity to adopt feathered friends. 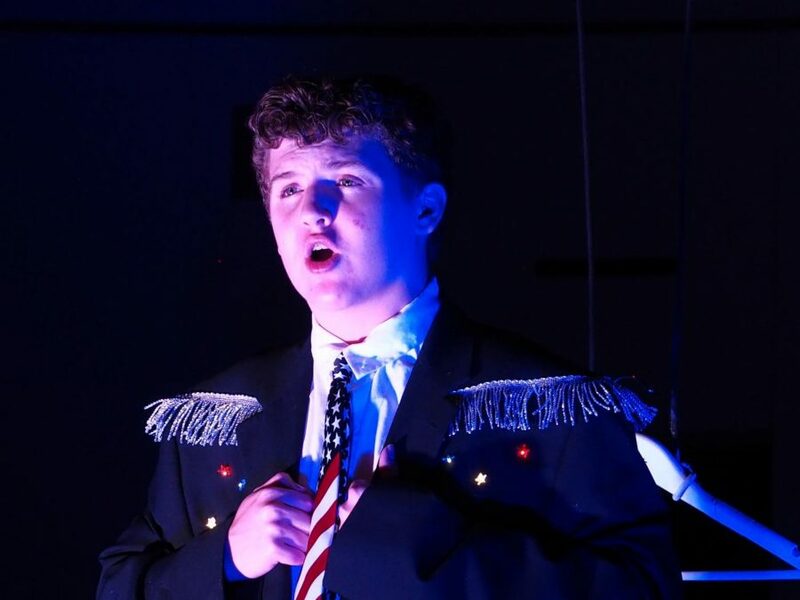 A PRESIDENTIAL PRODUCTION: .”44 Plays for 44 Presidents” enjoyed the opened night of its Oval Office odyssey from Washington to Obama tonight in the Fine Arts Building Theater, starting with Freshman Griffin Butler as George Washington. 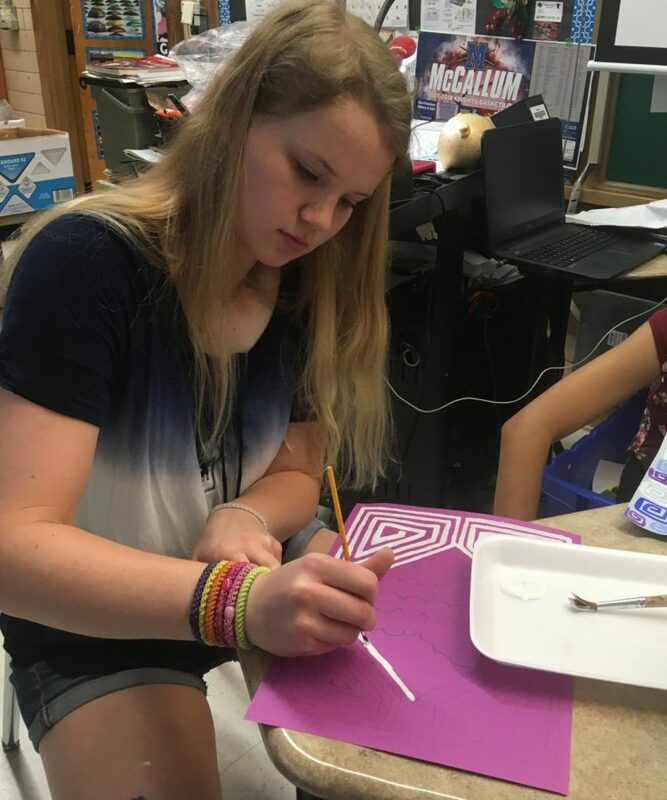 POST-TEST DE-STRESS: Sophomore Cameryn Borman and her AP Spanish 4 classmates “de-stress” by emulating Mola art from the Kuna Indians of Panama. “Imitation is the best form of flattery,” said instructor Juana Gun, who added that she was going to decorate her room next year with the artwork her students created today. The AP Spanish Language and Culture test was on Tuesday. For some students in the class, the test lasted eight hours. RAIN-VASION: This morning’s torrential rain caused a window to pop out in Ms. Shin’s classroom, a prolific leak at the entrance to the science hallway and multiple leaks in the journalism classroom that prompted newspaper students to shut down the file server and a whole row of computers and cover them with trash bags. 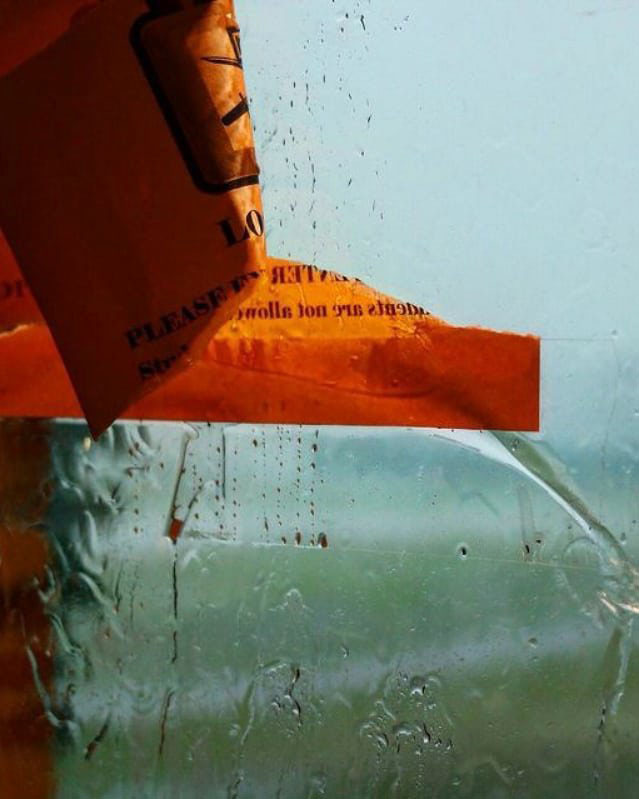 The administration even temporarily lifted the recently instated lock policy so that students in portable classrooms could enter the building quickly to get out of the rain. KNIGHT TO REMEMBER: Congrats to the 2018 Prom Queen and King: Sarah Kay Stephens and William Magnuson. After much preparation, hard work and anticipation, the “Knight to Remember” finally arrived on Saturday night, April 28. 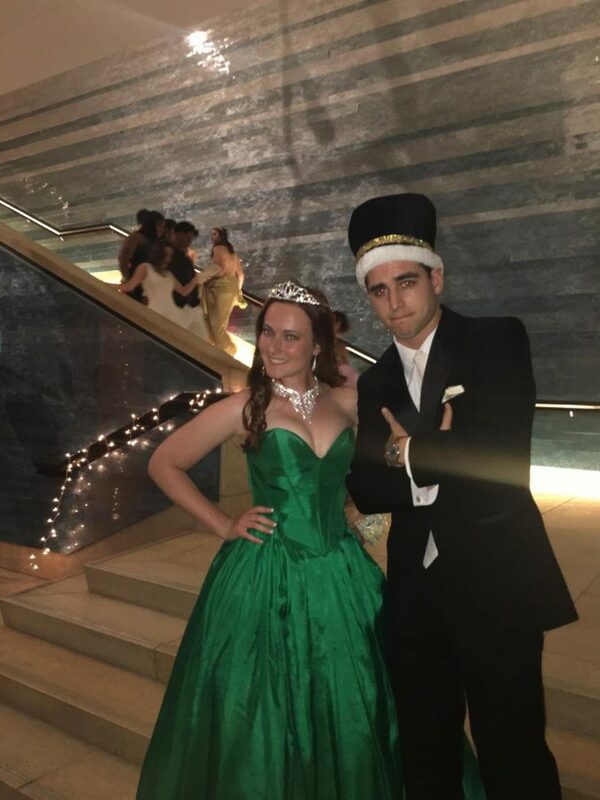 “The highlight [of prom] was being with my closest friends and enjoying our last school dance,” senior Georgia Whitworth said. Senior class co-sponsor Sarah Hathaway added, “I thought it went great. We had many helpers, and it made the setup and takedown pretty easy. I loved the theme and thought that we represented it well. 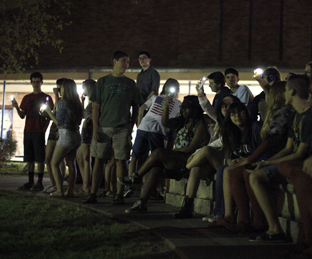 Also, there was no drama, and everyone looked amazing.” Photo by Celeste Montes de Oca. 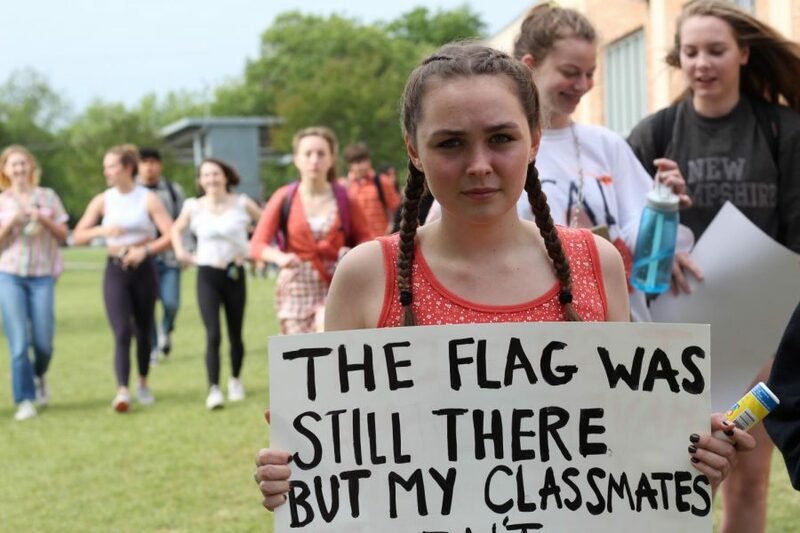 Joining the brigade of other students outside the front of McCallum, Molly Gardner silently falls into the crowd during the moment of silence as students march to the band hall parking lot. Photo by Madison Olsen. 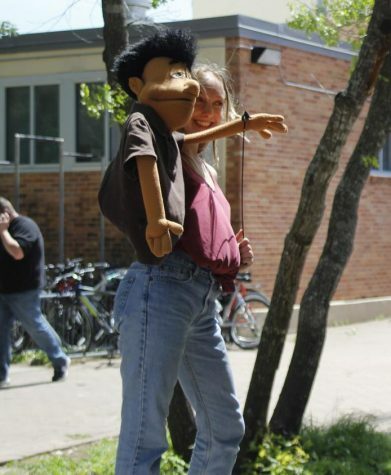 A HAND MADE TALE (April 11): As part of its class project exploring children’s theatre, the Theatre 4 class worked outside today during third period, learning how to operate puppets in order to tell fairytales. 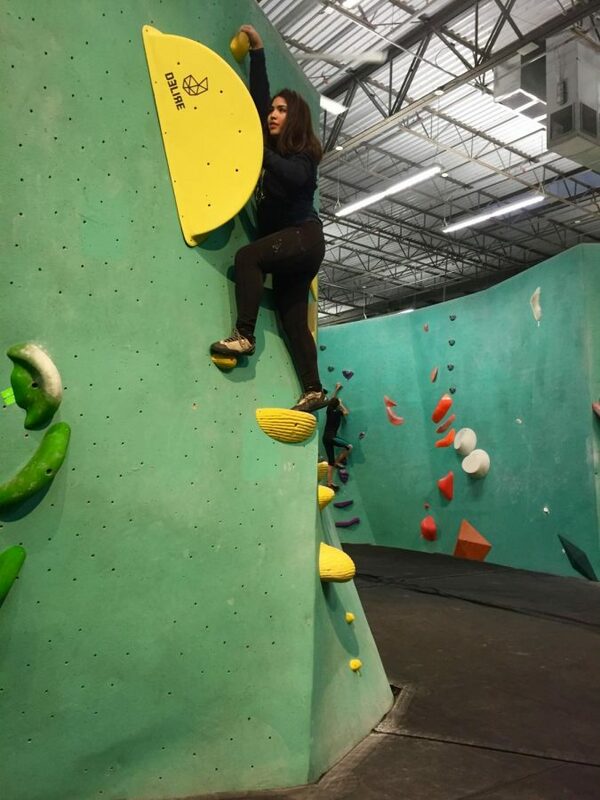 “We got to unleash our inner child,” senior Evalyn McCusker said, “and it was a blast and a half.” Photo by Tomas Marrero. 16 GOING ON 15 (April 8): Sophomores Lucy Smith and Richard Hernandez dance at the McCallum High School Ballet Folklórico Quinceañera tonight. 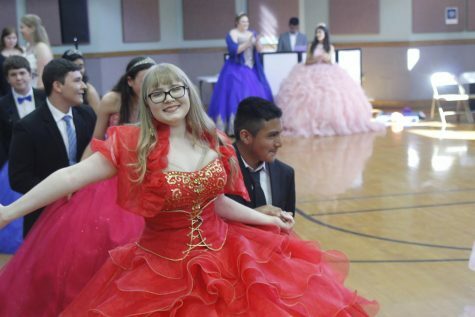 Of the 16 McCallum girls who participated in the event, some had never had a quinceañera, some were celebrating their quinceañera for a second time, and four were celebrating their real quinceañeras. The quinceañera started with a dance routine that the 16 girls and their partners practiced everyday at lunch for two weeks and was followed by lots of food, music and more dancing. McCallum Spanish teacher, Juana Gun, coordinated the event for the third straight year in order to give McCallum girls a chance to participate in the Latino cultural celebration. “This started when one of my Ballet Folklorico girls said, ‘Mrs. Gun, did you have a quinceañera?’ and I said, ‘No, my family couldn’t afford it,'” Gun said. 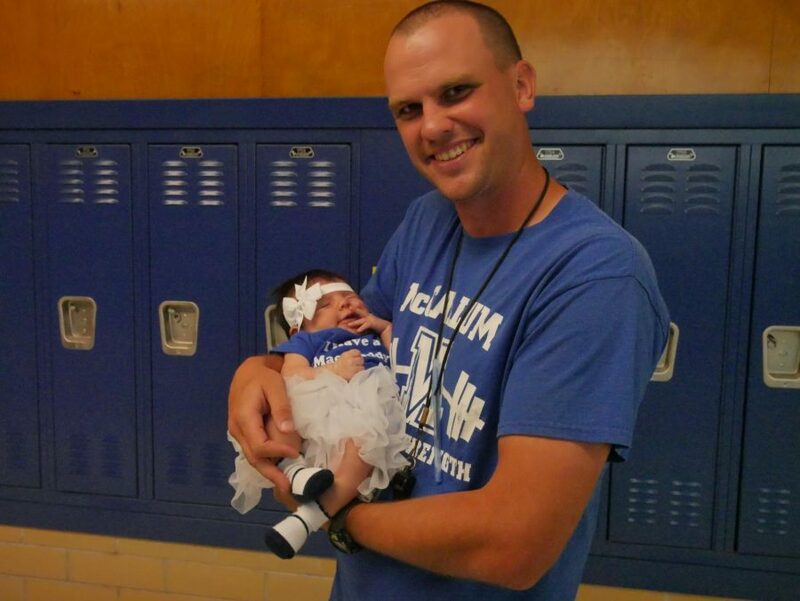 “So, we brainstormed how we could have a McCallum High School quinceañera for people that wanted to be in it.” Photo and reporting by Steven Tibbetts. 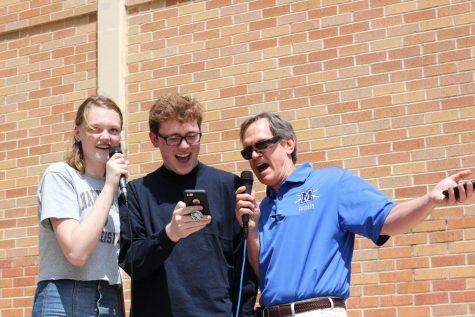 MAC JUST WANTS TO HAVE FUN (April 6): The final day of #academyweek was an eventful one, featuring Mr. Garrison, Abi Richter and Tryston Davis singing “Girls Just Want to have Fun” at the karaoke station in the fine arts courtyard. In addition to performances from Garrison and other students, the Fine Arts Academy week also showcased stage fighting lessons in the theater with Mr. Denning. In the main hallway, there was Virtual Reality Club demonstration. “[Planning this week] involved a lot of communication with the heads of the fine arts departments,” Dietz said. 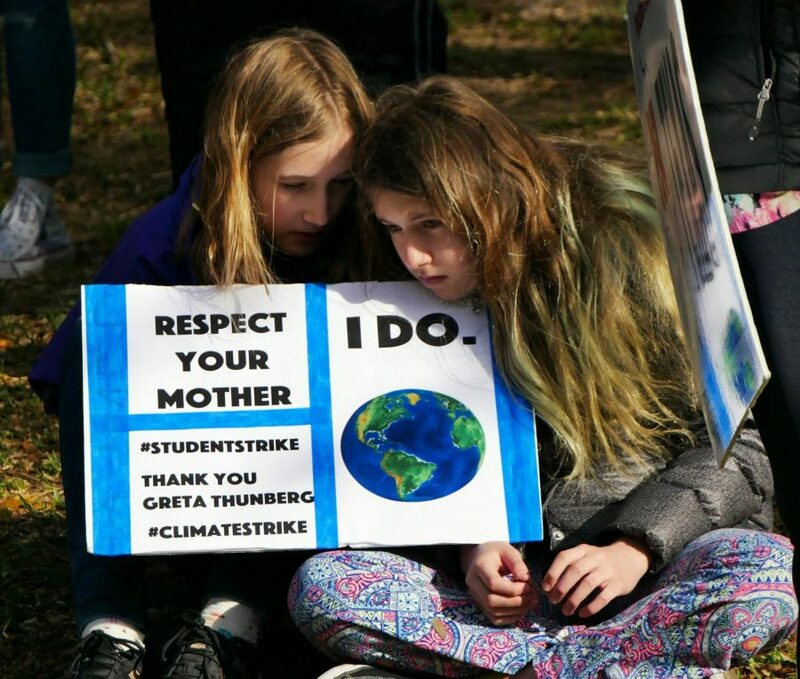 “[But most of the] events were successful.” Photo by Madison Olsen. Wednesday (April 4) was another eventful day in the inaugural #AcademyWeek. The day’s offerings included musical theatre, dance, piano and knot tying. 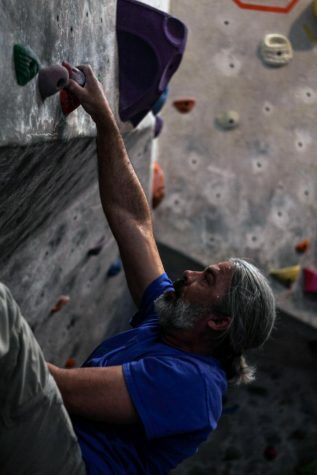 Thursday’s lunchtime offerings include First Edition in the ampitheater, a guitar trio in the solar classroom, a film demo in the English portable courtyard and tap dance in the Fine Arts Building Theater. Photos by Harper Cummings. 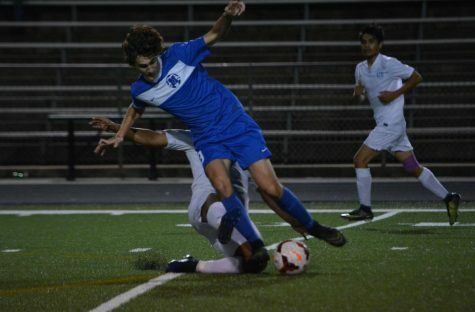 FEVER PITCH (March 30): The varsity boys soccer team hit the playoff pitch at full speed Thursday night, building a 2-1 halftime lead, thanks to goals by Gerohan Irias and Ezekiel Sengiyunva. Unfortunately, the momentum shifted in the second half as Dripping Springs came back to win, 5-2. 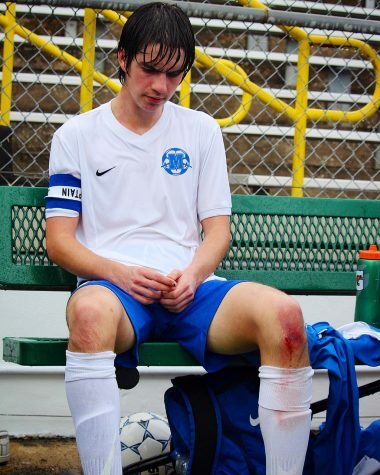 “The boys gave it all but it just wasn’t enough,” Coach Nick Martin said in a postgame Tweet. “I’m so proud of these boys and all they gave this year.” Congrats to the coach and his players on an outstanding season. Photo by Isaias Cruz. 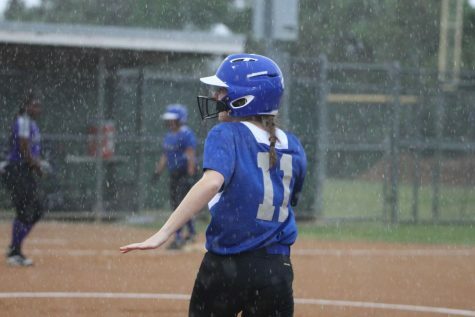 A WET WIN (March 27): Thanks in large part to a 12-run second inning, the varsity softball team routed LBJ tonight 23-8 at Noack. Alicia Rivera hit an inside-the-park home run while going 2-for-3 with five runs batted in. Addie Race, shown here, was 3-for-3 with two RBI’s and two runs scored. The JV game was cancelled, but that did not stop them from supporting the varsity from the stands. Zoe Hocker pitched a complete game striking out seven Jags. Photo by Gracie Ross. A SPINTERESTING PRACTICE (March 27): Cynthia Castro and Janet Perez were among the Ballet Folklorico members who gathered together on Tuesday in order to get down their newest songs. During these practices members prepare for multiple upcoming events of this year, including their Quincenera dance performance. 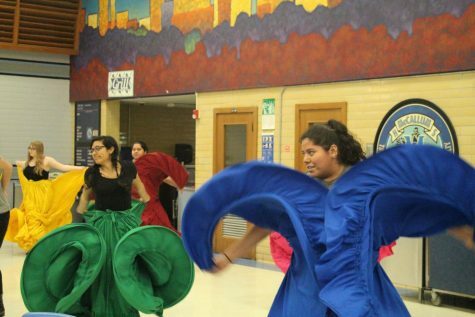 “Cinco de Mayo is coming up so we have to learn a bunch of dances for different schools,” Perez said. “At first we learned Veracruz, then we learned Chiapas and now we’re learning the Bird Dance.” Photo by Finn Shehan. 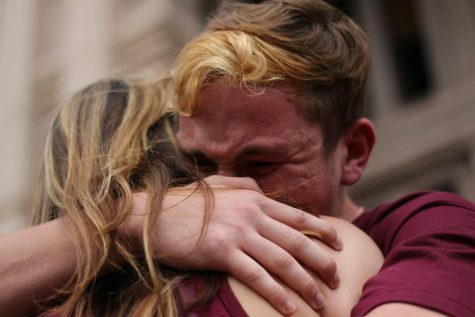 NEVER AGAIN (March 24): Marjory Stoneman Douglas High senior Jack Haimowitz shares an embrace after his emotional speech at today’s #marchforourlives at the Texas Capitol in downtown Austin. Haimowitz spoke of the awful Feb. 14 shooting on his campus. 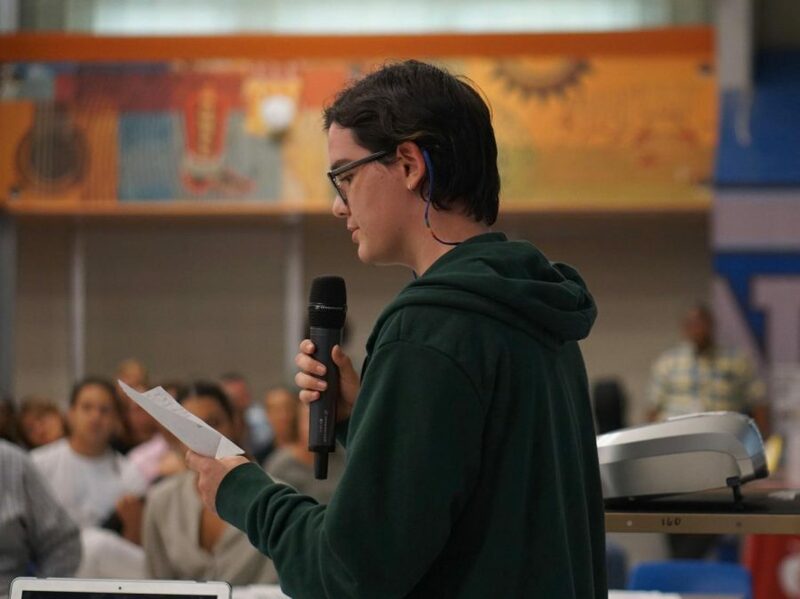 “What took place on Valentine’s Day not only stripped the students of Douglas of their innocence, but it brutally ripped 17 lives from their homes.” He also spoke of the resolve he and his classmates and have found since the shooting. “We are the change we never knew we needed, and we have found the strength that we never knew we were looking for. … Every day I see people not only wishing for change but refusing to accept anything else.” He also pleaded with the audience for unity. “If we ever wish to fully overcome the hatred and fear of a scale such as this, we must unite as Americans regardless of the societal, racial and physical constructs put in place to hinder our unification.” Photo by Madison Olsen. 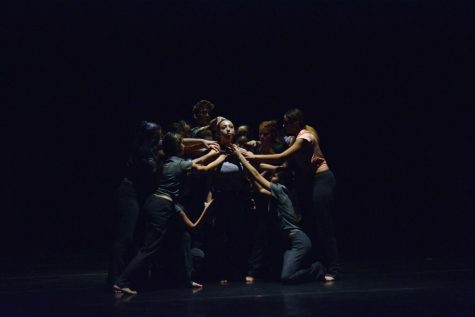 IRRESISTABLE FORCE (March 22): Senior Ruby Dietz along with the rest of the pre-professional dance company performs “Force,” choreographed by guest artist Lisa Kobdish during tonight’s dress rehearsal. 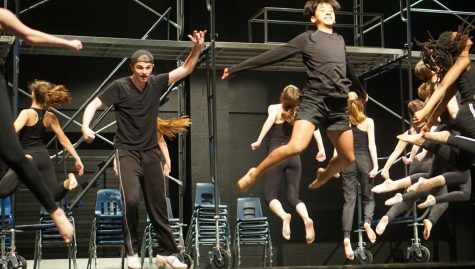 The McCallum Youth Dance Company will presenting its show, “The Butterfly Effect” Friday and Saturday at 7 p.m. Tickets are $12 for adults and $7 for students. Photo by Annabel Winter. 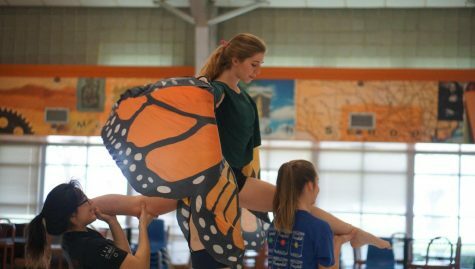 MONARCHS INDEED (March 19): Fresh off a first-place finish in the Texas Color Guard Circuit in the Scholastic Regional A class on Saturday March 10 at Cedar Park High School, the winter guard practices during fourth period today in the cafeteria. The guard will compete this Saturday at Hendrickson in the TCGC Area (West) Contest. If they place in the top three, the guard will advance to the state competition. Photo by Trent Huffaker. 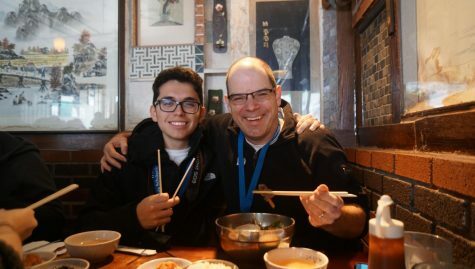 LIVE FROM NEW YORK (March 14): It was a full day in Upper Manhattan for the MacJournalism crew attending the Columbia Scholastic Press Association Spring Journalism Convention. The day ended at the Apollo Theater where the group took in the Amateur Night experience. In the morning, two Mac students attended sessions that observed today’s national youth walkout for gun control. After a day filled with educational sessions, including photography sessions by the distinguished Mark Murray, and a delicious lunch at Mill Korean, the group received a critique of the 2017 yearbook. Photo by Mira MacLaurin. 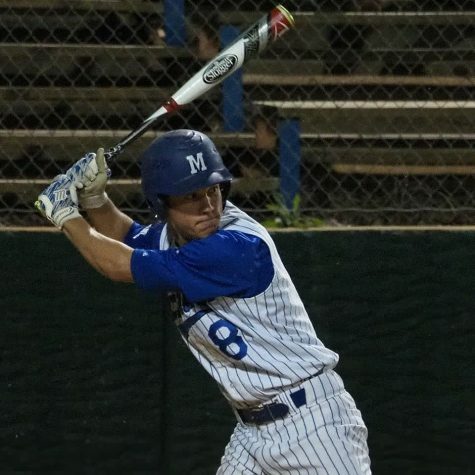 BATS THE WAY YOU DO IT (March 12): Starter Mason Bryant struck out 11 Maroons and drove in three runs, and Cole Ross went 3-for-4 with an RBI as the varsity Knights produced 10 hits in routing Austin High, 8-2, tonight at Northwest Park. Koehler Vandament, shown here, and Alex Baylor each scored a pair of runs, and Trinidad Dela Garza drove in two runs with a double. Reace Lane tripled in the game. Eric Worden got the final seven outs in relief. The Knights play Austin High again tomorrow at Burger to end the two-game series. Photo by Gregory James. 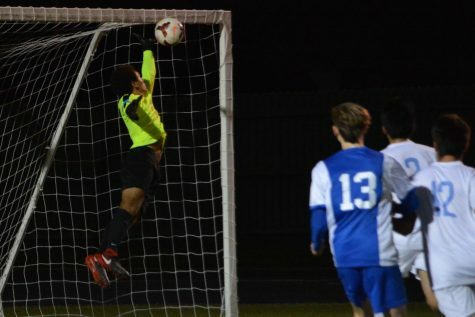 TIED FOR FIRST (March 9): Thanks to goals by Ezekiel Sengiyunva and Gerohan Irias and a clean sheet from goalkeeper Eric LaWare, shown here, and the Knight defense, the varsity blanked Reagan 2-0 to pull even with Austin High atop the district standings. The Maroons have a game with Travis tomorrow and need a win or draw to break the first-place tie. The Knights, who have won eight games during a nine-game unbreaten streak, have clinched second place and a state playoff berth. Photos by Isaias Cruz. UNBEATEN SEASON: (March 9): Tommaso Gaddi scored once and Reed Johnson twice, as the JV Knights earned a 3-3 draw against Reagan tonight at Nelson Field to complete an undefeated season. Anthony Bataille, shown here, made a terrific pass to set up one of Johnson’s two scores. Photos by Isaias Cruz. PAINT IT PURPLE (March 8): To mark the occasion of International Women’s Day today, Anna Marceau brought acrylic paint to school for some celebratory face painting. Atticus Tait was among the folks who accepted her invitation. 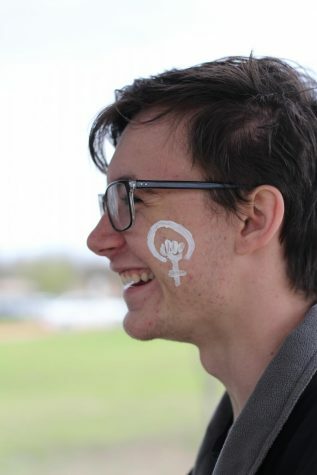 Students got all kind of symbols painted on their faces: hearts, feminism symbols and flowers. Photo by Madison Olsen. 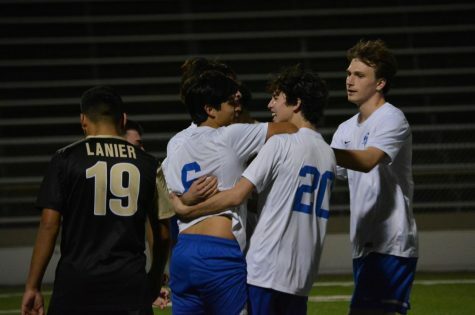 VARSITY 2, LANIER 2 (March 6): The Knights celebrate Marcel Lopez-Reed’s goal, which helped them earn a draw Tuesday night at House Park. The result extended the varsity’s undefeated streak to eight games. Photo by Isaias Cruz. JUST EnCASED (March 3): The winter guard place fourth out of 19 team’s in the Scholastic Regional A Division at the Texas Color Guard Circuit competition at Leander High School on Saturday. 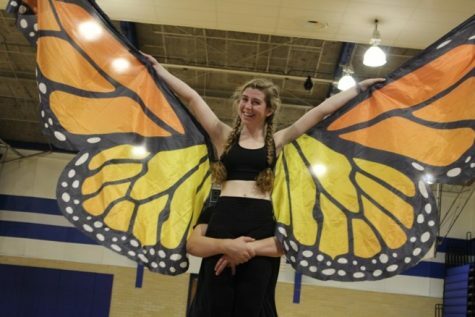 (1) Freshman Moses Copeland lifts junior and guard co-captain Claire Rudy so that she can show off her wings that she uses to start off the color guard’s show, “EnCASED.” Photo by Sydney Gomez. 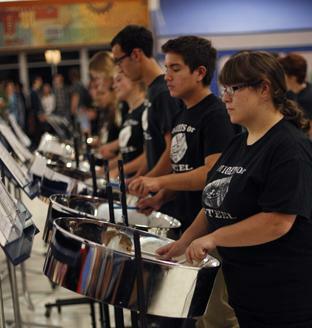 TURN IT INSIDE OUT (Feb. 22): The Knights of Steel, the Bowie Steel Band and the Austin Community Steel Band, played their annual Inside Out Steel Drums Concert Thursday night in the cafeteria. The Samba Knights, joined by the Austin Samba group, performed a halftime show of sorts and revved up the crowd. 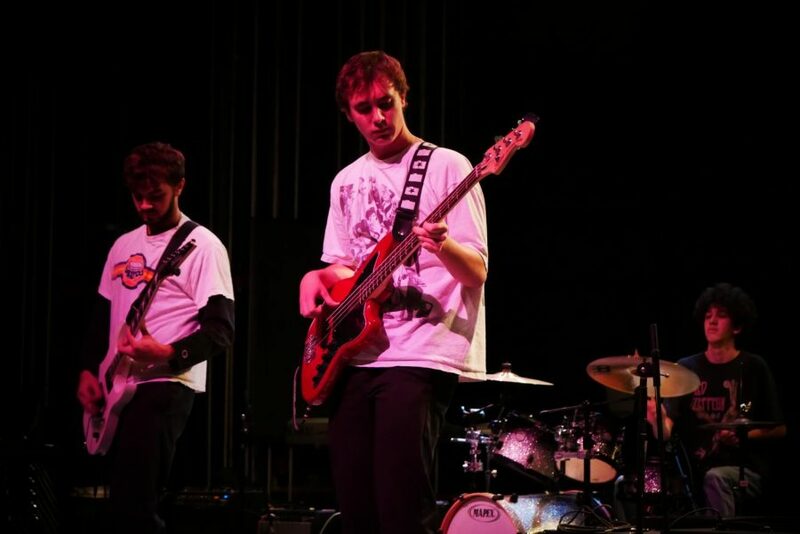 “It gave off a very different vibe than the rest of the concerts,” said sophomore Mira Maclaurin said, who appears in the fourth photo in this gallery. 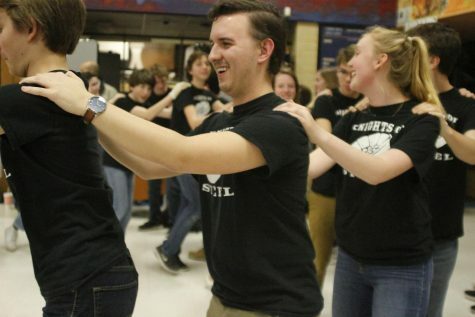 “It was a lot more focused on dancing and singing and celebration.” Photo by Lily McCormick. 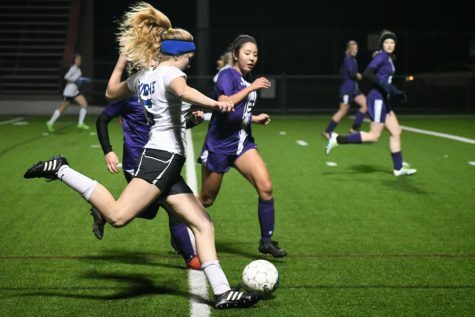 KNIGHTS WIN PK THRILLER (Feb. 21): After a scoreless tie in regulation, tonight’s girls varsity game between Mac and LBJ came down to PK’s. Thanks to Molly Blankenship, Izzy Gillespie, Delaney Carter and Lily Morales, the Knights converted all four of their attempted penalty shots, and Lindsey Plotkin made two clutch saves including the gamewinning save on LBJ’s final PK attempt. Henna McRae was up next for the Knights but didn’t have to shoot because LBJ had no attempts left and Mac led, 4-3. Photos by Bella Russo. 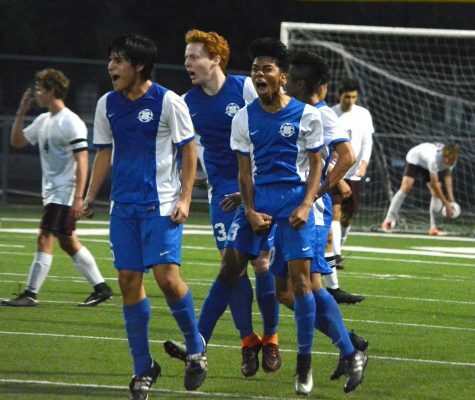 FIVE IN A ROW (Feb. 20): Gerohan Irias joins Marcel Lopez-Reed, Jerry Howard and Adrian Martinez in celebrating one of his three goals as McCallum beat Austin High in the rematch between the two district foes. The win was the team’s fifth in a string of seven straight wins. Photo by Isaias Cruz. 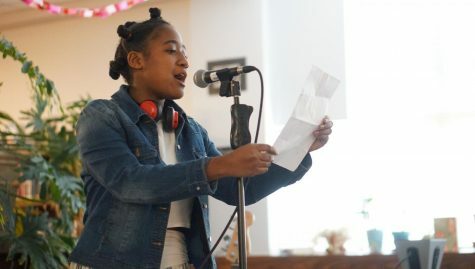 BACK TO THE GRIND (Feb. 16): Performers at today’s Valentine’s Day-themed coffeehouse played songs and read poetry pertaining to matters of the heart and matters of the world. Sophomore Jalyn Wilbourn read a poem of hers about the recent school shooting in Florida. “I’d originally written a Valentine-y poem, and then we got the news of what happened on Valentine’s Day, and I got inspired to write it because this is the 18th one of 2018; it’s insane.” Reporting by Lily McCormick. Photo by Molly Gardner. MOORE TO THINK ABOUT (Feb. 15): Juniors Ray-Mya Hardeman and Gavin Hurtado and sophomore Sam Werkenthin were among the students who found out today that a presentation from University of Texas history professor Dr. Leonard Moore is an interactive experience. 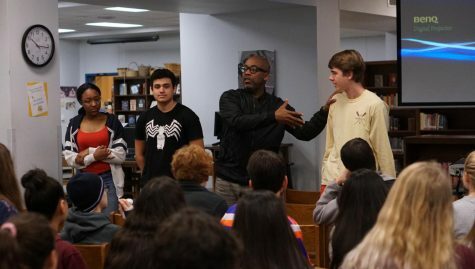 With a presentation that often included direct conversation with members of the audience, Moore, the interim vice president for diversity and community engagement at UT, visited McCallum today as part of the school’s observance of Black History Month. Among the points that Dr. Moore drove home during fifth period today is the idea that perspectives toward and opportunities in higher education are shaped by a person’s background. The parents of minority students, he said, are much more likely than parents of white students to put economic concerns about higher education first when determining where to send their kids to school. He also made the point that the opportunity for higher education for black students is disproportionately tied to participation in sports: 4 percent of the general UT student population is black, he said, while the vast majority of football, men’s basketball and women’s basketball players are black. He also urged students who are considering serving in the military to attend college first and then enlist in the armed forces rather than enlisting first and then pursuing higher education. Photo by Karel Tinkler. 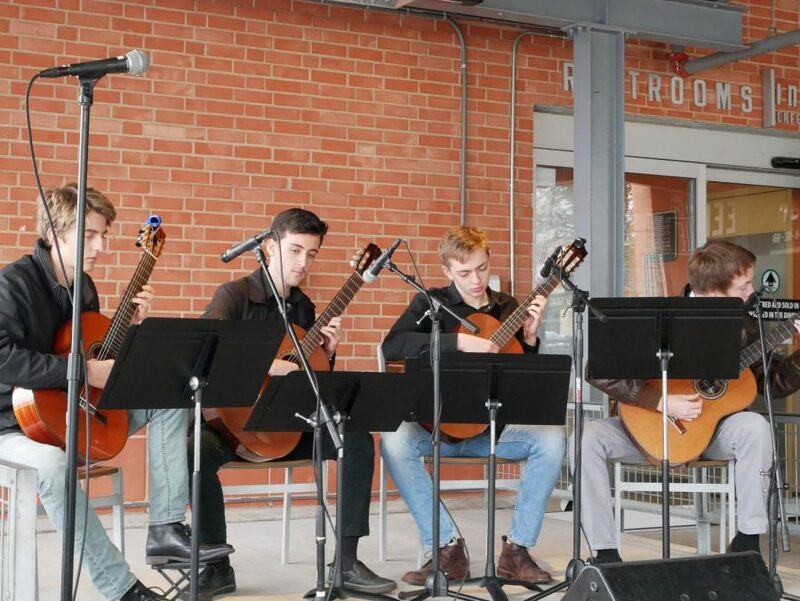 CENTER STAGE (Feb. 14): The McCallum chamber guitar ensemble and the two bands that won last semester’s Battle of the Bands performed at Stubbs BBQ Tuesday night. The ensemble played three lively pieces to raise money for the program’s field trip to California next Thursday. With extra time between performances, sophomore Riley Edwards played a solo piece to keep the crowd entertained before Status Loco and Frysk performed their sets. nough money to account for unexpected expenses during their trip. All guitar classes were invited to tour the campus and participate in a day-long festival at Vanguard University in Costa Mesa, Calif. “[I] really enjoy [these] guitar festivals and seeing people play,” senior Aaron Baldauf said. “[But] I’m [especially] looking forward to getting to bond with my friends.” Reporting by Kristen Tibbetts and Jasmine Barrera. Photo by Madison Olsen. 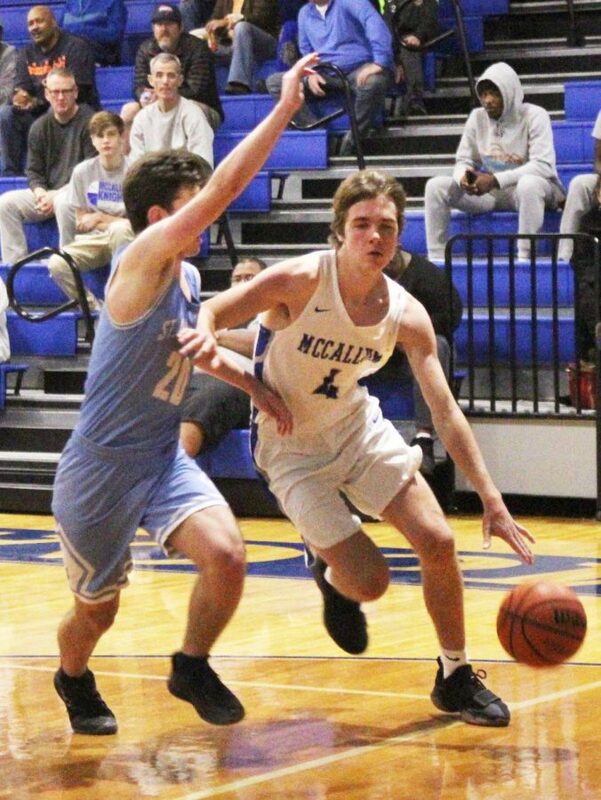 YOU WIN SOME (Feb. 9): The subvarsity boys basketball teams earned a home split against visiting LBJ Friday night in both teams’ final home game of the year. The freshman team beat LBJ, 67-54, while the Jags prevailed over the JV Knights, 68-52, despite this smooth-as-silk floater by sophomore Jacob Broaders. The subvarsity teams close out their season Tuesday night with a visit to Austin High. Photo by Ian Clennan. 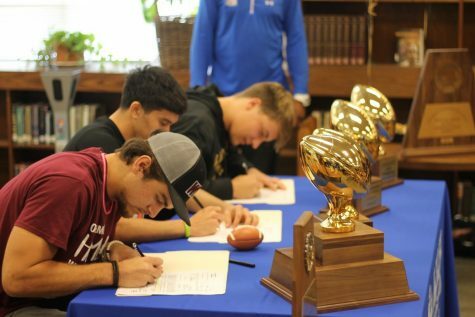 THREE OF A KIND (Feb. 7): Today, seniors Max Perez, Alexander Julian, and Judah Copeland signed their letters of intent to continue on playing football at the college level during lunch in the library. Perez signed to play at West Texas A&M, Julian signed to Navarro College, and Copeland signed to Harding University in Arkansas. 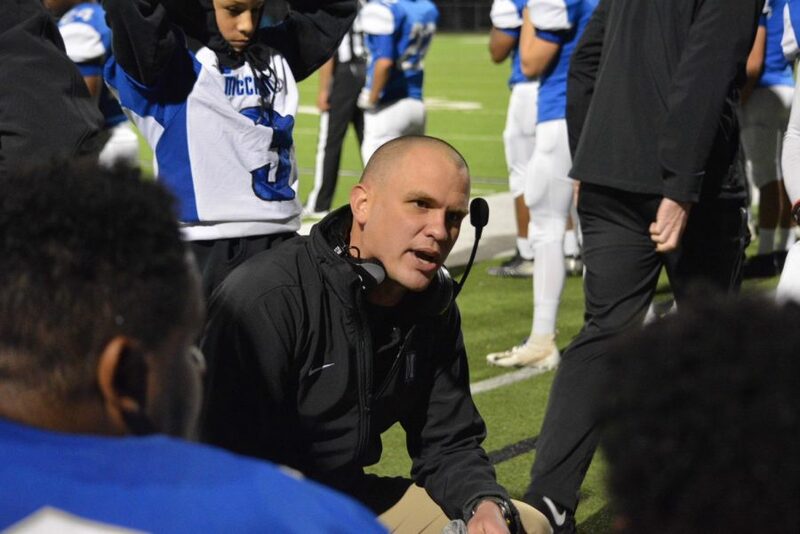 McCallum head coach Charles Taylor bragged on the three college bound athletes, talking about how much work they had put in over the years and how much they had improved since their sophomore season. Copeland and Julian were named AP first team all state and Perez was named 25-5A offensive MVP. Photo by Janssen Transsier. STILL IN THE HUNT (Feb. 6): Senior Marc Lopez drives between two Reagan defenders and scores an easy two points. The varsity Knights lost at home tonight to the Reagan Raiders, 73-65. 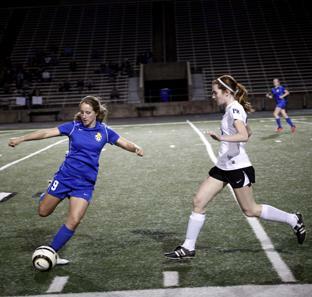 The Knights entered the night tied with Austin High for the fourth and final playoff spot in District 25-5A. The Maroons lost at last-place Travis, 60-58. The Knights face LBJ at home Friday then finish district play with what promises to be a do-or-die showdown at Austin High Tuesday. Photo by Joseph Cardenas. 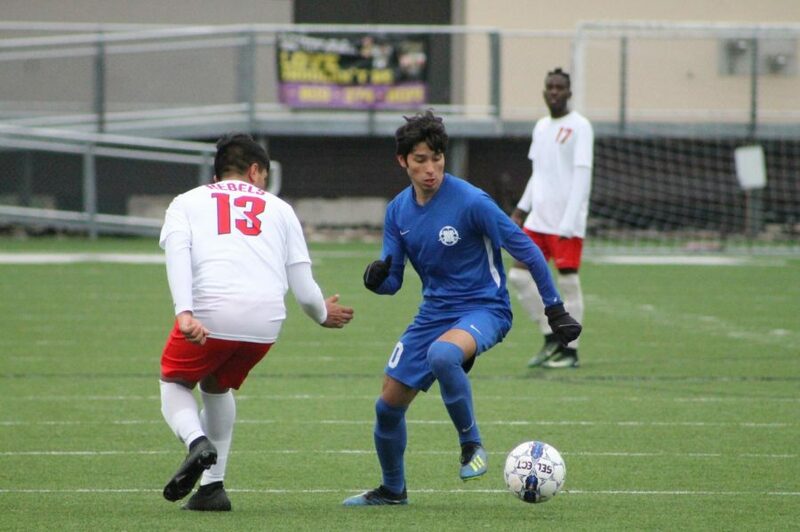 HEADED TO VICTORY (Feb. 3): After assisting Ezekiel Sengiyunva’s goal earlier in the game, Adrian Martinez scores the game winner as the boys varsity soccer team defeated Crockett this morning, 2-1. The team will try to win back-to-back games when it faces Lanier 10:45 a.m. next Saturday at Noack. Photo by Isaias Cruz. 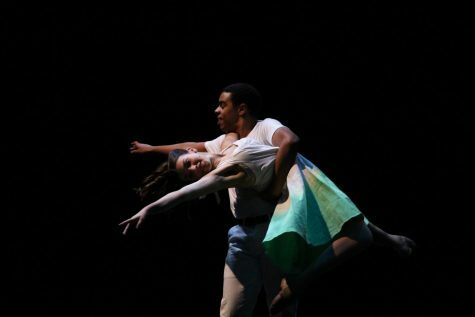 HOLD ON TO YOUR SEATS OR YOUR DANCE PARTNER (Feb. 2): Sophomores Owen Scales and Mia Terminella take center stage during their ballet duet in “Somewhere” during the opening night of West Side Story on Thursday night. Photo by Madison Olsen. JETS FOR LIFTOFF (Jan. 30): During Tuesday’s Act I dress rehearsal, members of the Jets open the show with a daring jump from a wall of chainlink fence. “It was scary at first,” Vandenberg said, “But it’s become routine.” Photo by Harper Cummings. ON TARGET (Jan. 29): What Green Arrow is to the Justice League and Hawkeye is to the Avengers, freshman archer Mariana Torres DeLine is to McCallum High School. The freshman archer achieved a personal-best score of 266 points out of a possible 300 at Sunday’s National Archery in the Schools Program tournament at Lamar Middle School. 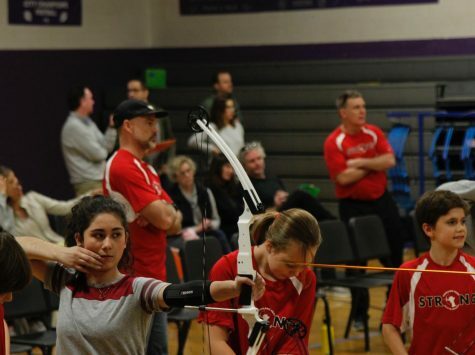 As McCallum’s only archer at the competition, Torres DeLine went to the tournament hoping to score high enough to qualify for the state NASP tournament. She will find out in about a week if her score was high enough for her to qualify. She began archery while a fourth-grader at Highland Park Elementary, where her dad teaches physical education and coaches the elementary school’s archery team. Her dad was at the tournament yesterday coaching the Highland Park team and saw her best day ever as an archer. Photo by Kristen Tibbetts. 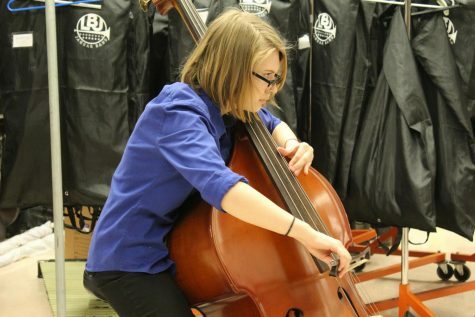 PRACTICE MAKES PERFECT (Jan. 27): Junior Erin Caylor intensely practices in the warm-up room before heading to the judging room at the annual UIL Solo and Ensemble contest on Saturday. Photo by Sophia Shampton. 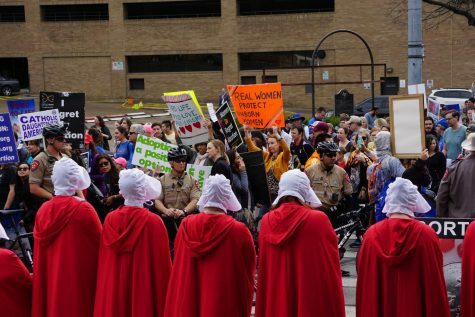 MARCHERS RALLY FOR PRO-LIFE MOVEMENT: Handmaids stand in silent protest at the pro-life rally on Jan. 27. Stephanie Martin, the organizer for the Texas Handmaids, coordinated the protest. “When we protest, we do so silently to reflect the fact that our voices aren’t heard or valued in the seats of power,” she said. “We prefer to show them the reality of what they are aiming for and silently haunt them. The robes and our stoic faces are louder than a scream.” Photo by Emma Baumgardner. Junior Camilo Auyero sits on the bench during halftime of McCallum’s 3-1 loss against Austin High on Jan 27 at House Park. 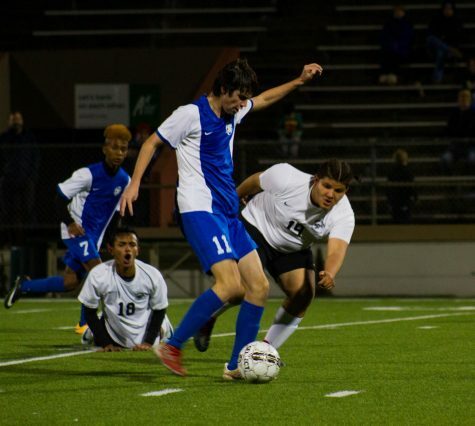 The game against Austin High marked the Knight’s lowest point in the season as it put them at 0-5-2 for the year. Photo by Joseph Cardenas. ONE YEAR AFTER protestors descended on Austin to reject their inaugurated president, they returned downtown on Jan. 20 to announce that they still found him unfit for office. “This is a country of immigrants,” marcher Todd Cary said. “The way [Trump] discriminates against immigrants and minorities is wrong, and I’m very much against it. We’re going to start 2018 by voting out some of his senators and congressmen.” While calling for Trump’s impeachment and campaigning for Democratic replacements of Trump allies, those who marched from City Hall to the Capitol today also observed a second Women’s March. 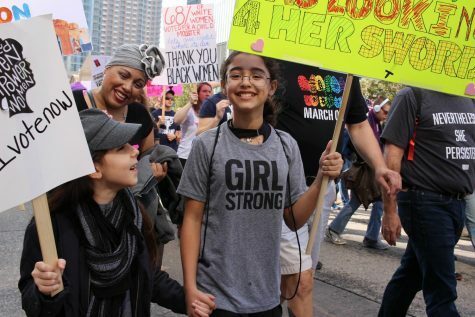 “We wanted to honor the memory of the march last year, which was one of the most moving experiences of our lives,” said marchers Sarah and Tula Richardson. Finally, the march commemorated the anniversary of the Roe v. Wade Supreme Court decision that established a federal right to abortion. Former Texas senator and Democratic gubernatoral candidate in 2014 Wendy Davis was among the featured speakers at the Capitol. 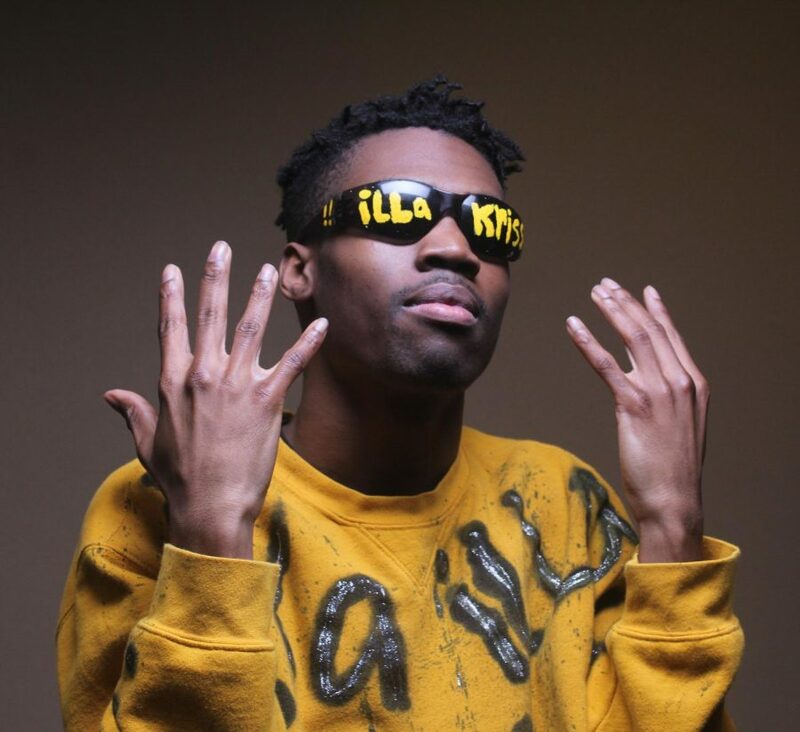 In an exclusive interview with Macjournalism, Davis said, “No matter the resistance we meet in fighting for our reproductive rights and so many of the other things we care about, if we can just own the power of our own voice, we will be a part of a movement that is ultimately going to overwhelm that opposition and is going to realize change.” We will have more of our interview with Davis plus a second exclusive interview with state representative Donna Howard, D-Austin, the keynote speaker at the afternoon rally. Photo by Madison Olsen. 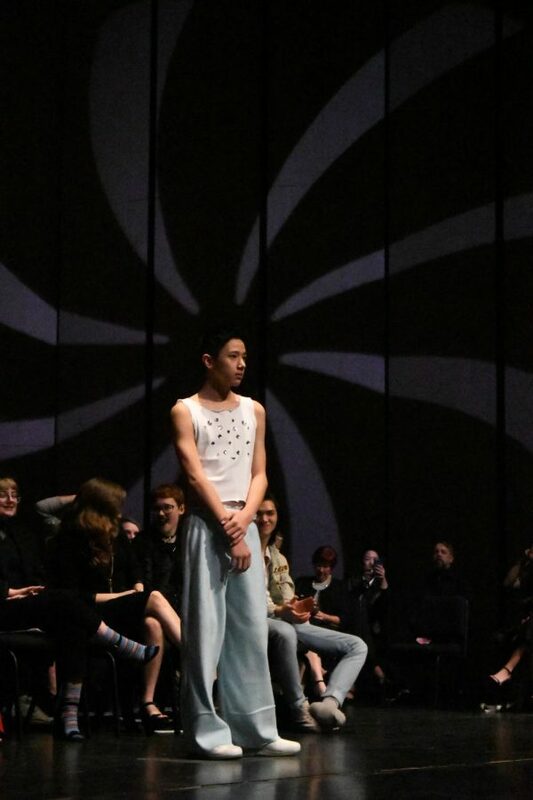 THE LOR OF THE RUNWAY (Jan. 13): At McCallum’s annual benefit fashion show on Saturday night, 12 student lines were showcased by 49 student models. The collections followed the theme of Icons Only: each designer chose an icon that inspired their work. In this image, model sophomore Louis Lor models junior Nola Hammer’s line, which was inspired by Bubbles, the Power Puff Girl. Third place went to senior Genevieve Temple, whose icon was actress and model Jane Burkin. Second went to senior Bethany Raup, who was inspired by rapper Kwon Jiyong. 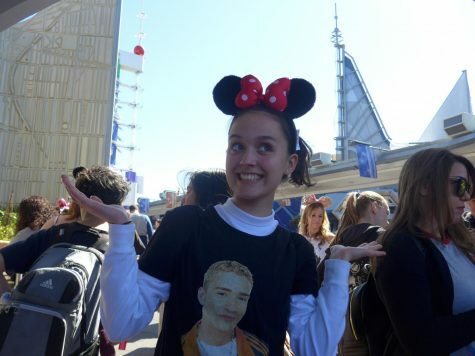 Freshman Veronica Crist took first place and chose actress Zendaya as her icon. Proceeds from the show benefitted the McCallum visual arts department and Out Youth, a local support organization for LGBTQIA+ youth. Photo by Bella Russo. 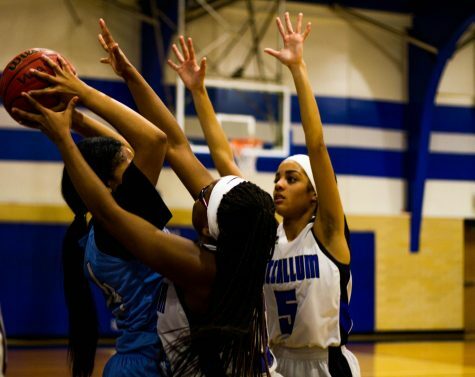 REPELLING THE RAIDERS (Jan. 12): Thanks to suffocating defense, including this double team by seniors Cordeja Hopes and Keyrra Wright, the host girls varsity defeated the Reagan Raiders tonight in 25-5A district play. Photo by Ian Clennan. 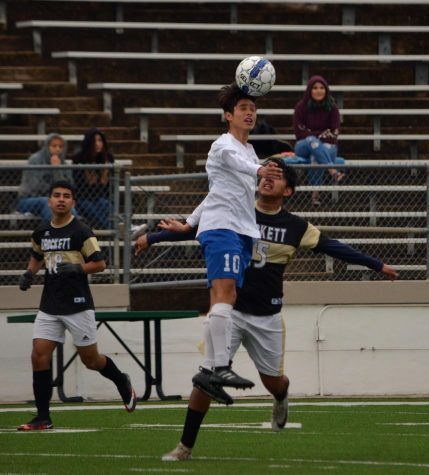 VARSITY SOCCER FALLS IN OPENER (Jan. 5): Repossessing the ball, junior Camilo Auyero slips in front an Eastside opponent after a throw in by Eastside. The Panthers defeated the Knights in their season opener tonight at House Park. Photo by Ian Clennan. 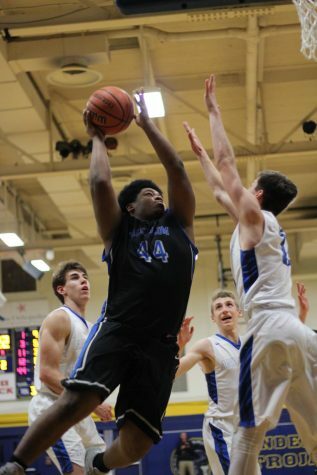 TROY STORY (Jan. 5): The boys basketball teams were swept at Anderson tonight in non-district games. 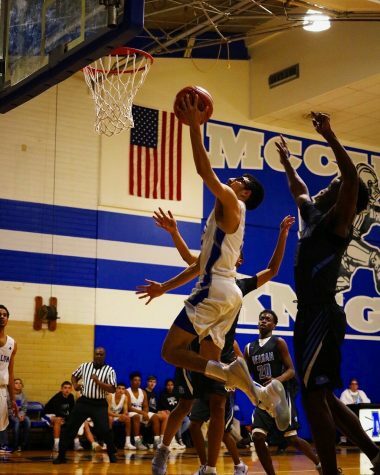 In the JV’s 48-28 loss, Alvino Carbajal led all Mac scorers with seven points. Photo by Madison Olsen. HAIL YES! 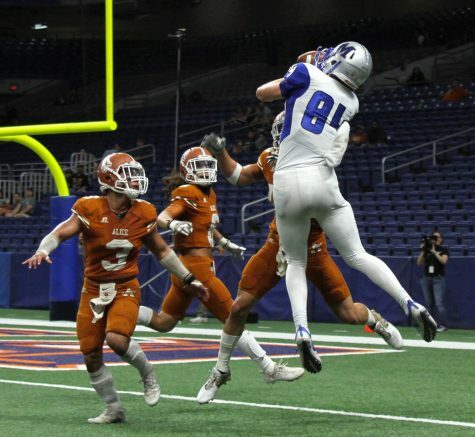 In the 5A D2 Region IV semifinal in San Antonio’s Alamodome on Dec. 2, McCallum took a 14-8 lead it never surrendered after Mason Bryant pulled in this 47-yard, half-ending Hail Mary pass from Max Perez despite triple coverage. Earlier in the quarter, Bryant, also the team’s punter, fielded a bad snap and dashed for a first down to extend the drive that led to this play and proved to be the decisive momentum changer for the game. After halftime, the 2017 Knights cruised to a 33-8 win to improve to 13-0 for the season while also avenging a 51-year-old playoff loss to the same school that ended the 1966 Knights perfect season at 11-1. Many of those Knights were in attendance to see their old score settled. Photo by Ian Clennan. Senior David Ruwwe takes a water balloon to the back during the PALS annual Pink Week fundraiser “Peg-a-PAL.” The PALS raised over $1,200 for Breast Cancer research. Photo by Rylie Jones. 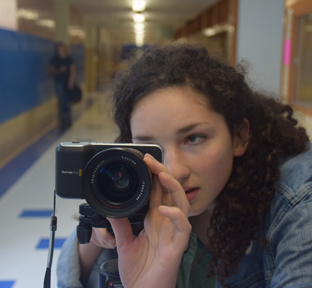 Junior Elizabetta Diorio shoots a short film for her Audio Video Production class. Dioro recently advanced to state UIL for her films “Lucy and Grasshopper” and “Plastic Bag.” Photo by Mary Stites. 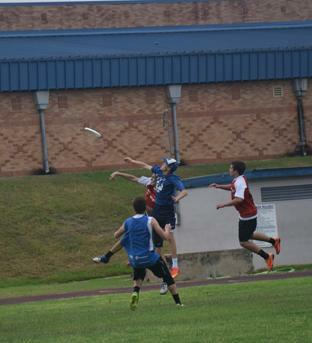 Ultimate frisbee players jump to make a catch April 19th. Photo by Mary Stites. Dancers align in the spring show April 11. Photo by Aiden Foster. Listeners gather in the courtyard where student bands are playing at the Spring into Music band fundraiser. Photo by Aiden Foster. 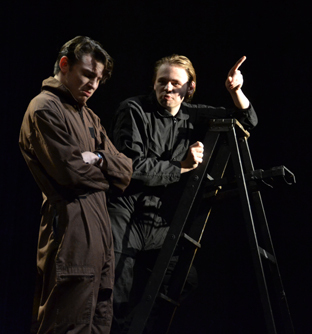 Junior Max Corney and senior Peter Richard act as technicians in a play within a play. 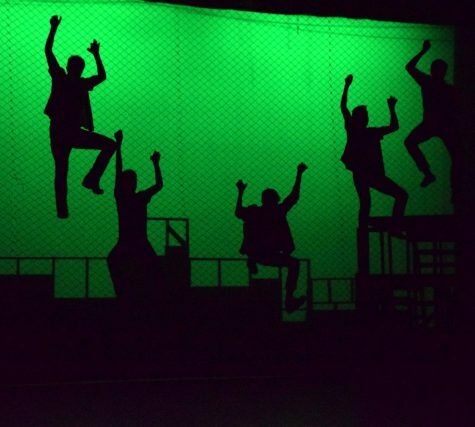 The show, “Cut,” was part of the student-directed shows March 27. Photo by Maya Coplin. 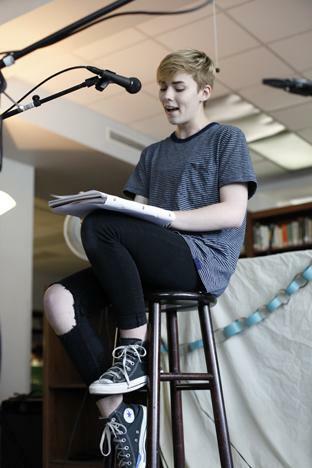 Sophomore Emerald Ferrel recites her poem “varos” at Excalibur’s Coffeehouse March 26. Photo by Aiden Foster. 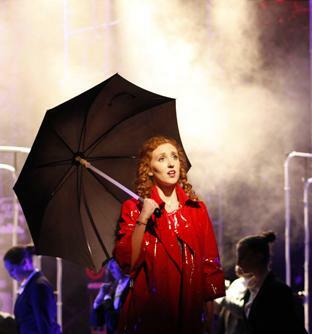 Sophomore Ellie Zambarano sings in the rain as Molly Jensen in the musical “Ghost.” The show ran the last two weekends on the MAC stage. Photo by Aiden Foster. 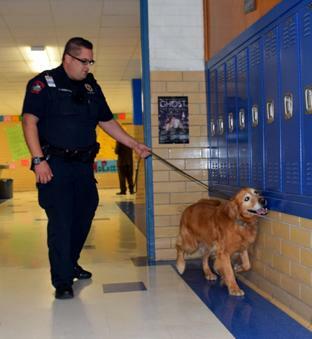 Campus police officer Anthony Andrews walks Rocco the drug dog down the hallway to search the lockers. Read more about Rocco in the upcoming issue of The Shield March 13. 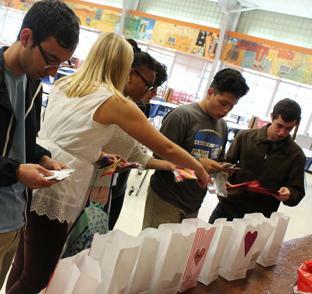 PALs distribute valentines at their Valentine’s Day party in the cafeteria last Friday. Photo by Natalie Murphy. 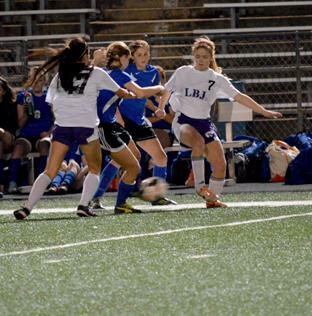 Freshmen Molly Blakenship and Isabelle Gillespie scuffle with two LBJ players in the recent girls soccer game. The Knights won 3-1 in this district rivalry game. Photo by Nick Robertson. Senior Janie Contreras shows some of the jeans that have been donated as part of Interact Club’s Teens for Jeans clothing drive. The club is collecting jeans through the end of the week and then bringing them to the local Aeropostle to donate to teenagers in need in the area. The goal of the club is to promote community service and build leaders, Contreras said. Photo by Aiden Foster. 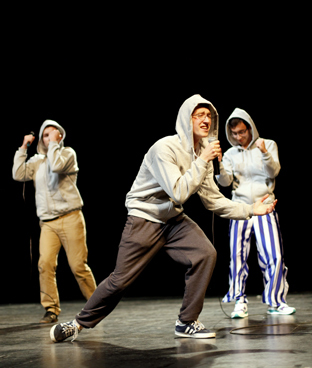 Seniors Colin Youngblood (center), Jake Janssen (left) and Miguel Minick (right) sing together during the talent portion of the Mr. McCallum show last Friday. Youngblood was named “Mr. McSassy.” Photo by Aiden Foster. Junior Lily Dickinson runs to block a pass at Burger Stadium. The varsity girls soccer team lost against Anderson 3-1 Tuesday. Photo by Aiden Foster. 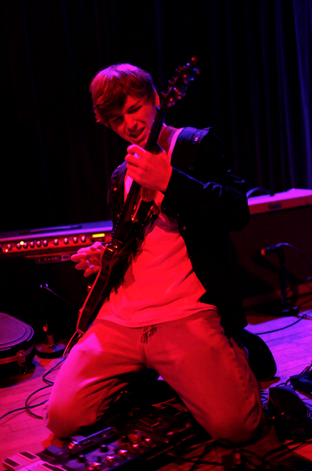 Senior Thomas Magnuson plays guitar with his band, The Mr. Clark Experience, at Stubb’s music venue and BBQ Wednesday. Photo by Aiden Foster. 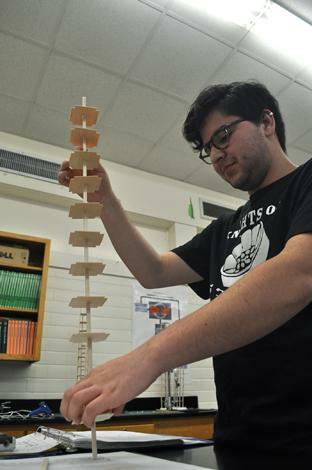 Senior Daniel Reyes constructs a balsa wood tower to test on a shaker table that simulates an earthquake. The project is part of a 6-week-long “Designing with Data” challenge in Engineering class. Photo by Mary Stites. 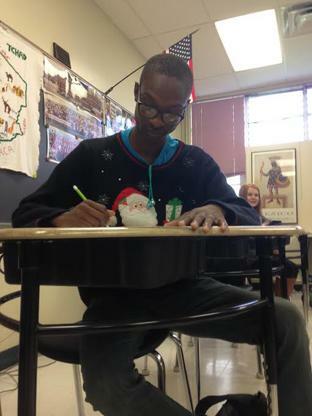 Senior Justice Phillips crams for his last final of the semester while wearing a Santa Claus sweater, which he said helps him keep at it and remember that Christmas break is right around the corner. 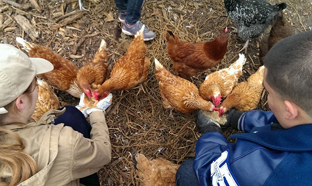 Junior Lily Dickinson and senior Carlos Arguello help feed chickens at Community First!, an affordable housing project by Mobile Loaves and Fishes. Dickinson and Arguello were volunteering Saturday with Key Club, which explores community service opportunities for students around Austin. Photo by Maggie Mueller. 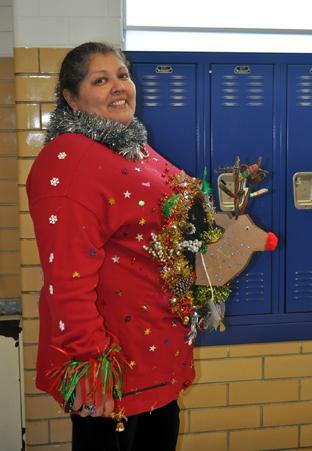 Security Officer Georgia Peña shows off her sweater for the annual tacky holiday sweater contest. She won second place. Photo by Haley Hegefeld. 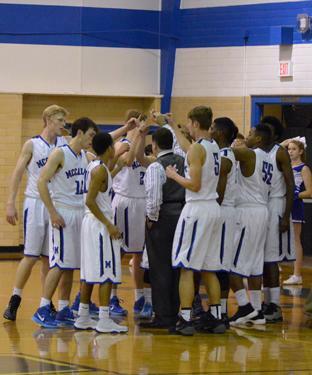 The basketball team huddles at its game against Eastside Memorial Tuesday night. The team won 97-46. Photo by Nick Robertson. 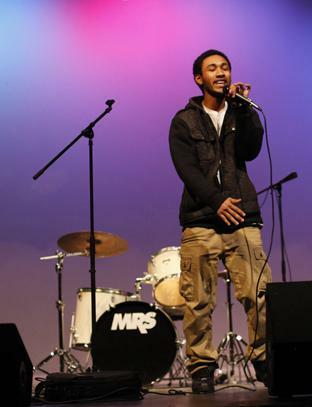 Senior Bomani Barton sings at the Battle of the Bands. 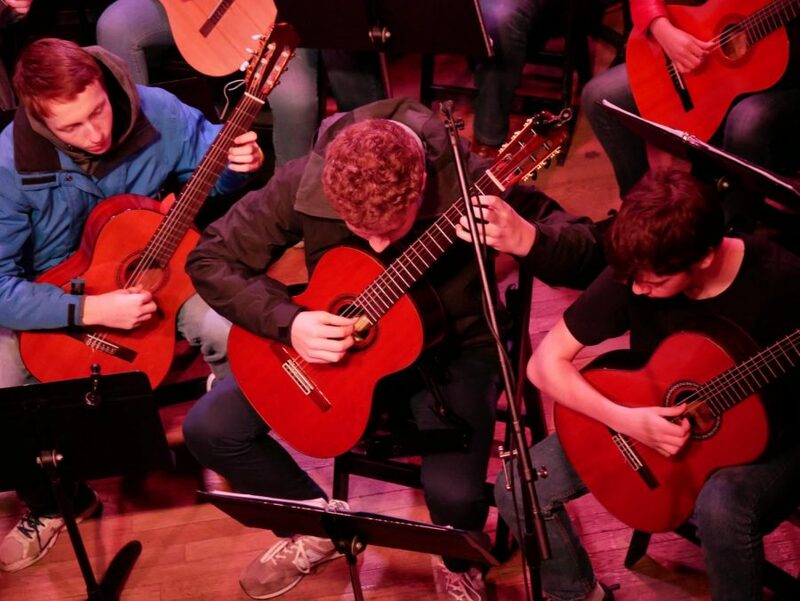 The show was a competition between student bands as a fundraiser for the classical guitar program. Photo by Aiden Foster. Sophomore Adina Morquecho and seniors Joe Cruz and Miguel Minick perform at the annual Knights of Steel dessert concert in the cafeteria Monday night. They are playing tenor pans in the advanced steel band. Photo by Aiden Foster. 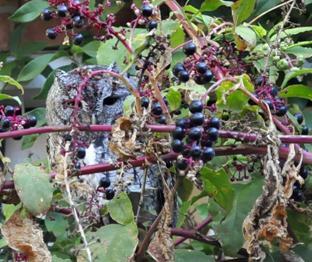 An Eastern Screech Owl hides from an aggressive mockingbird in a Pokeweed bush. The owl was spotted in the courtyard during Garden Club Wednesday morning. Photo by Seren Villwock. 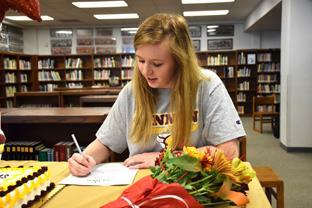 Senior Meghan Mitchell signs her National Letter of Intent to Gannon University in Erie, Pennsylvania. She was the recipient of a scholarship for acrobatics and tumbling. 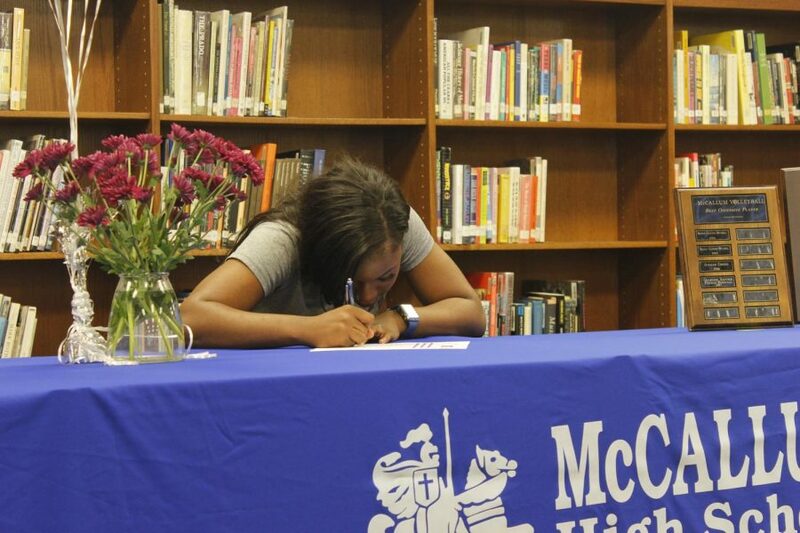 Senior Jessie Woolley-Macmath also signed Wednesday to Texas Christian University in Fort Worth for distance swimming. Photo by Mary Stites. 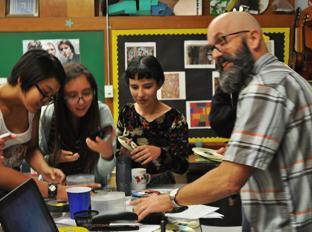 Teacher Thomas Watterson shares CDs with students in his English IV class, including seniors Zoe Watts, Abbey Perez and Alix McCanlies. Math teacher Richard Cowles found the stack of mixed CDs at a garage sale for $5 and gave them to Watterson. Photo by Seren Villwock.